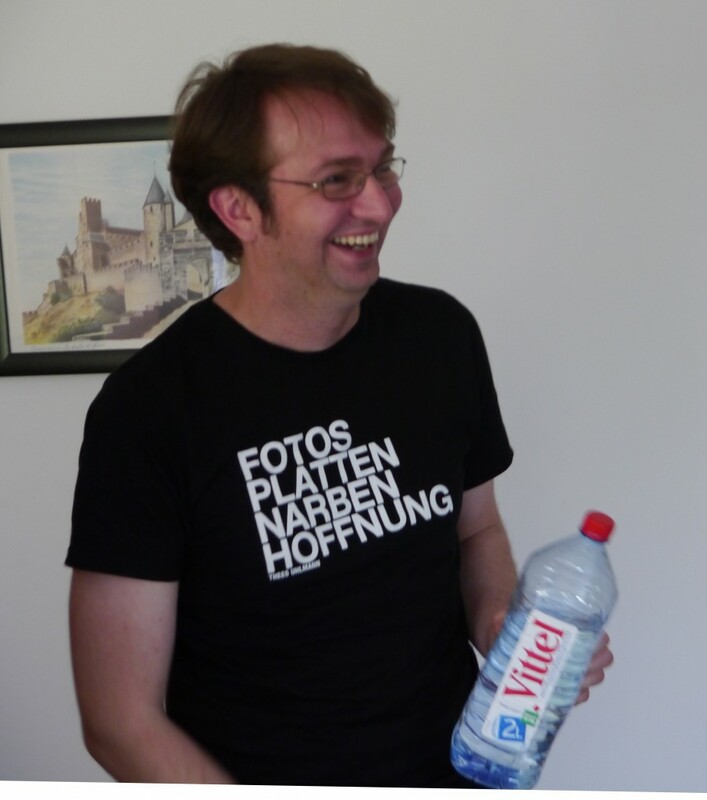 this time no pictures and no story – just a quick information that I’m moving. I really love this blog and with near 70.000 visitors until now I’m under the impression that you like it, too. Alas, now I’m litterally spammed away. Every day dozens of strange comments arrive, while I’m told by my friends that they find it hard to comment at all due to some bug in the software. 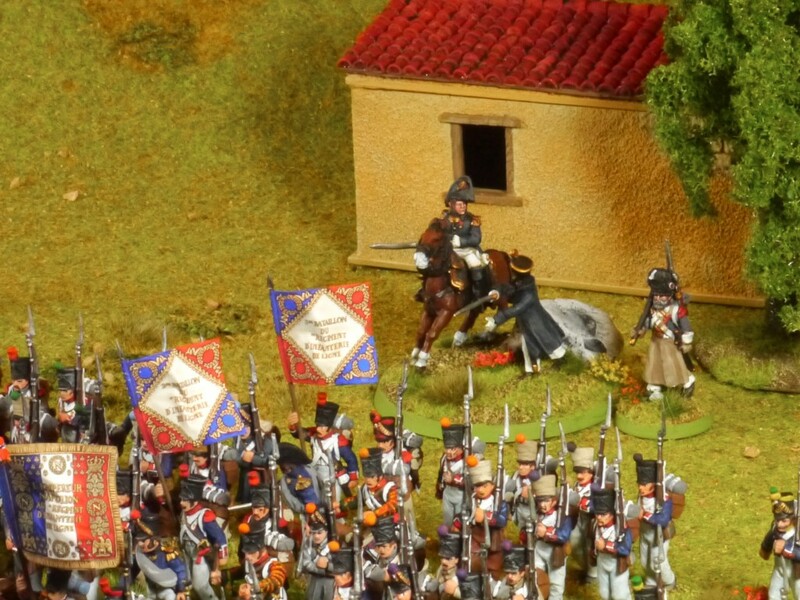 As you can see I have used the Kellermann-figure, yet I’ll use him as Pierre Fromage, a generic French Marshall who will command my French Forces. 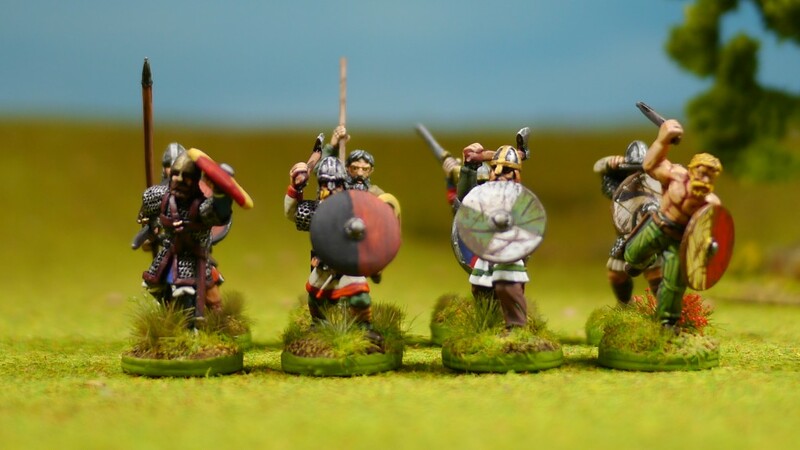 I also based two more batallions I’ve bought from ebay (with some enhancements and additional figures painted by myself), bringing the grand total up to 11 batallions. Three of them I’ll reform into Elite/Young Guard batallions in oder to form an elite-choice for lasalle, but this will be the topic of a later post. With the French nearly finished, I’ve been developing further plans. 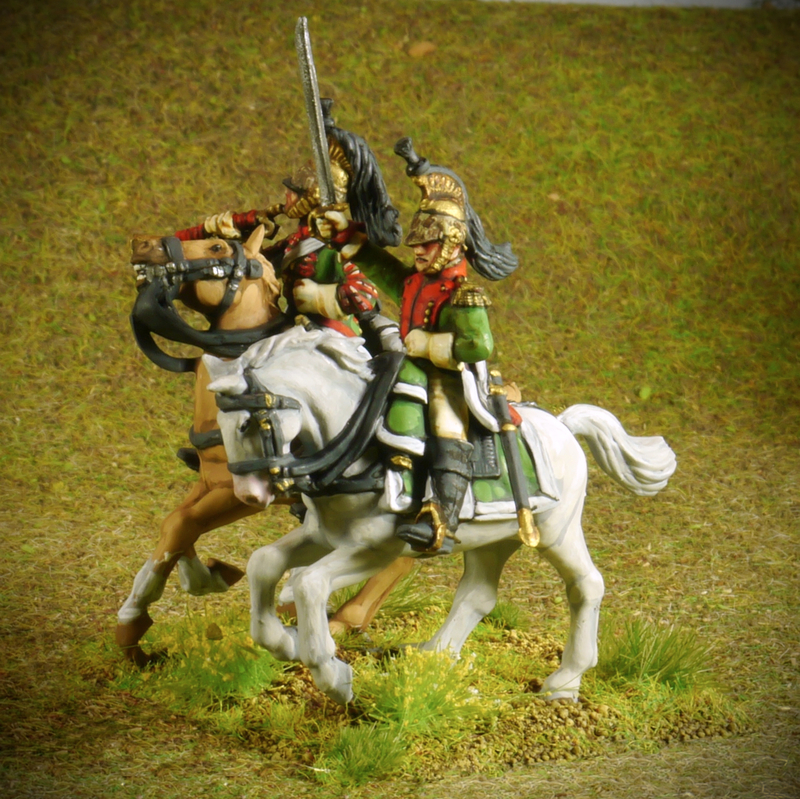 First I’ll enhance my British with a heavy cavalry option. 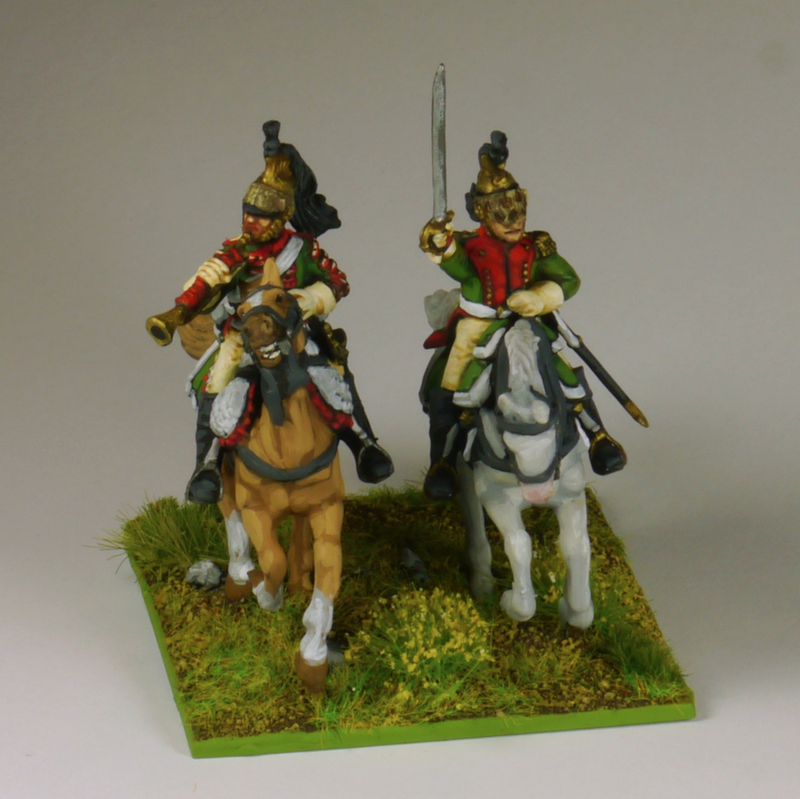 Then I’ll start a new project which will probably need some time to be finished – Napoleonic Russians! 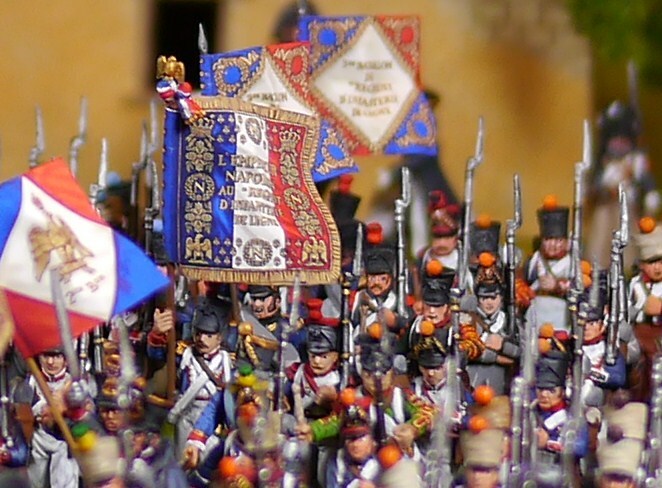 After the fantastic Lasalle-game we’ve played recently I’ve decided it would be very interestening to have the oppertunity to field the French in the Peninsular-variant as well. 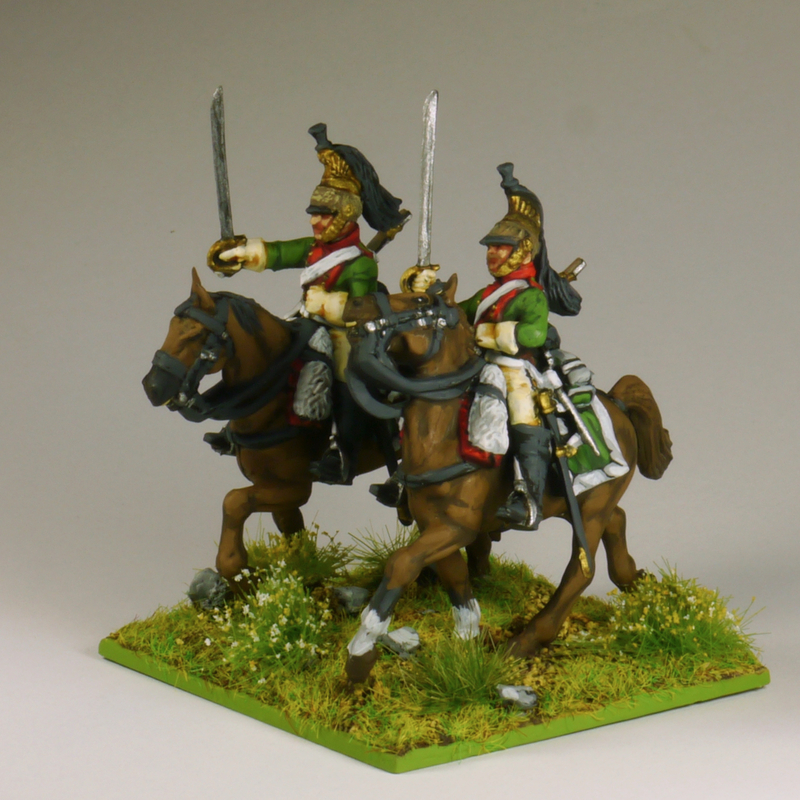 For this I need Dragoons, and thus I more then willingly sat down and painted this squadron. In my oppinion the Dragoon uniforms are among the best looking of the whole period. 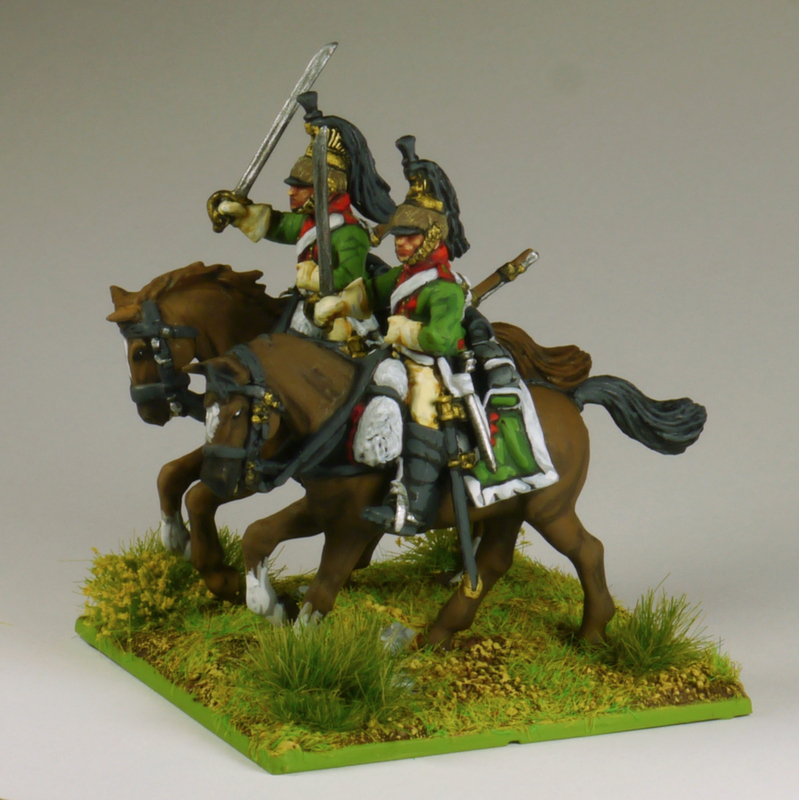 So it was really a treat to paint the figures and I’ve enjoyed it so much, that I’ll possibly add some more Dragoons to my army in the near future. But now without to much words a few more pictures. Finally! 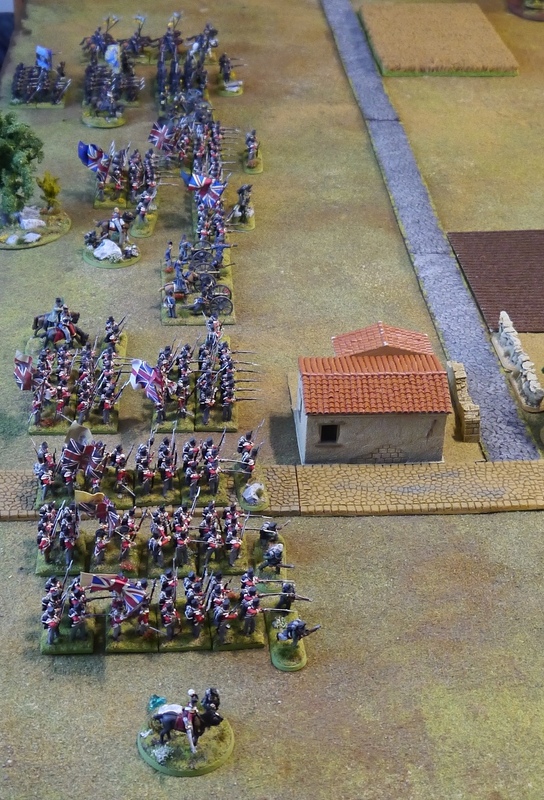 After over a year working on both the British and the French armies for Lasalle now these troops have finally been inaugurated (together with the new gaming mat, that also had yet to see serious action). 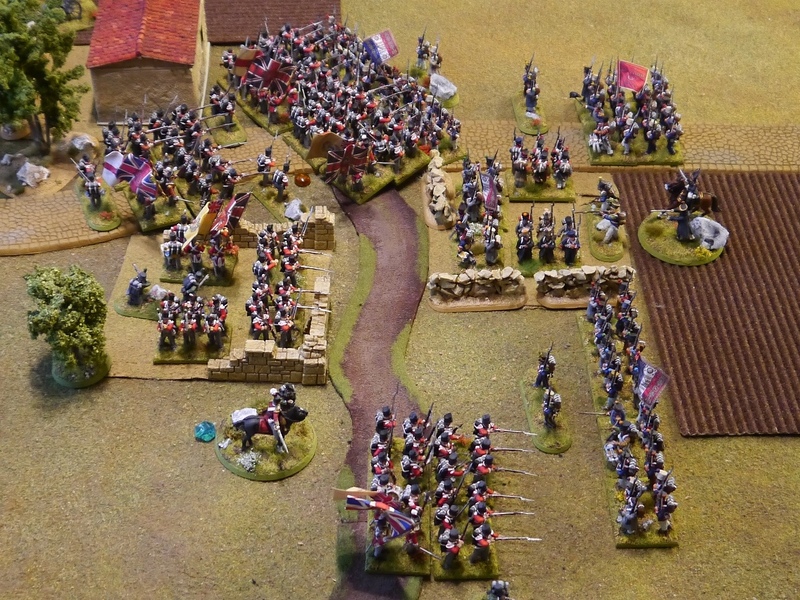 Today my good friend Bodo came over from Stuttgart, and we spent a very anjoyable afternoon battling for the “crossroads” – the Lasalle scenario that we had chosen by throwing a dice. As you can see from the picture above, the landscape was a road connecting the long edges of our 1,5m * 2,5m table and two slightly offset roads running from it to both short edges. Where the roads met, four build-up-areas formed a small village. Along one of the roads was a corn field (at the right side of the picture) counting as rough ground, and just outside the picture a little wood. The ploughed fields are just for decoration and were treated as even ground. 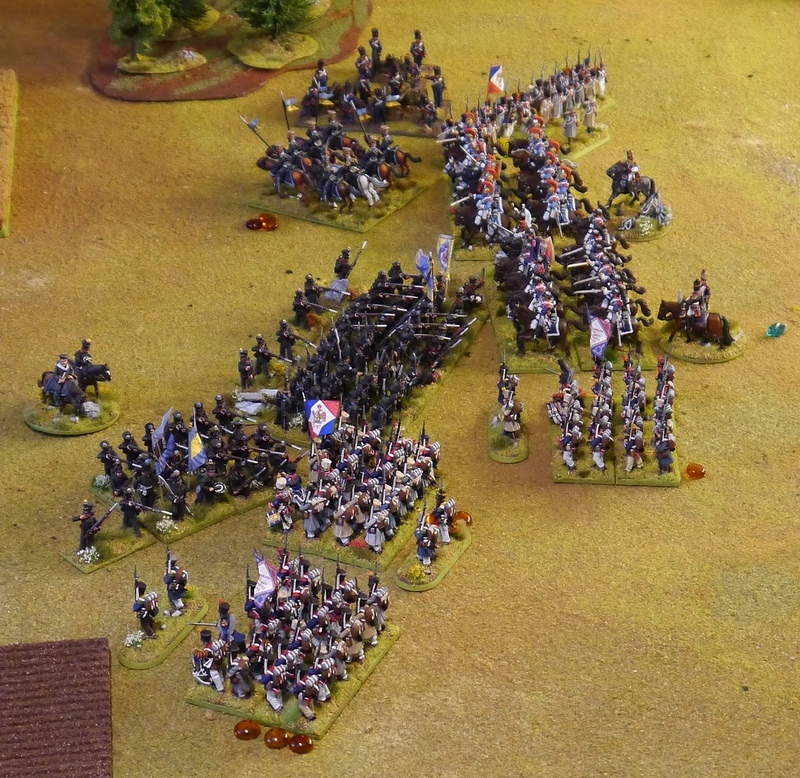 The French (played by Bodo) had deployed first and thus had the first move. 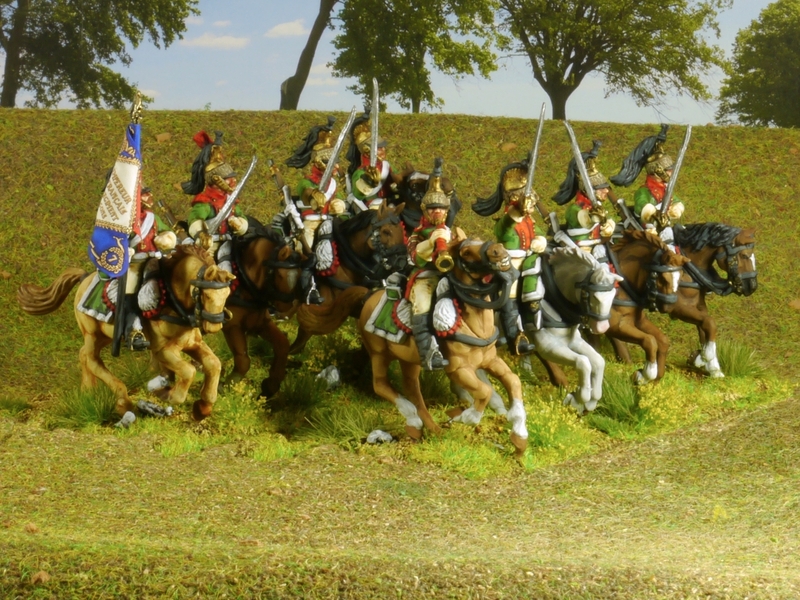 They started just with their core army, the heavy cavlary was not yet present – and since the cavalry commander sincerily lacked vigor there was a good chance they would not leave their breakfast for some time to come. 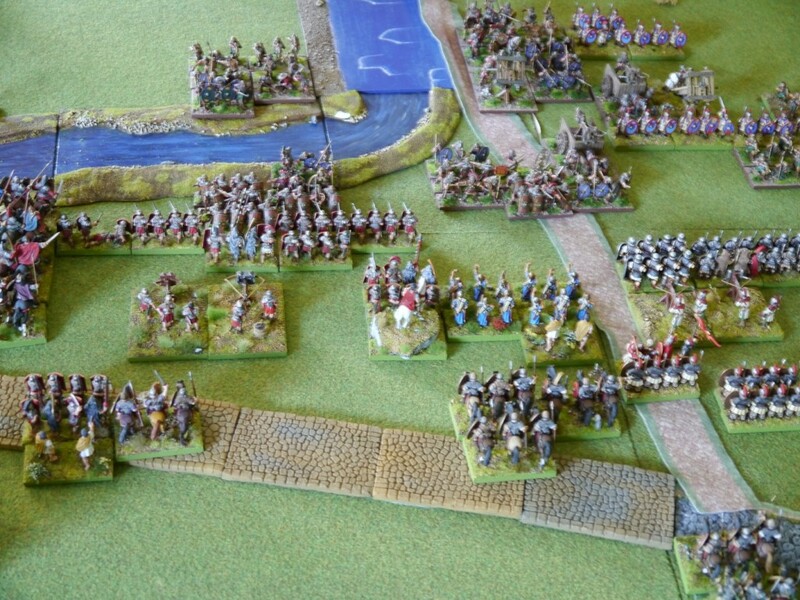 Consequently, for the French it seemed a wise decision to fortify their position and go for the village. 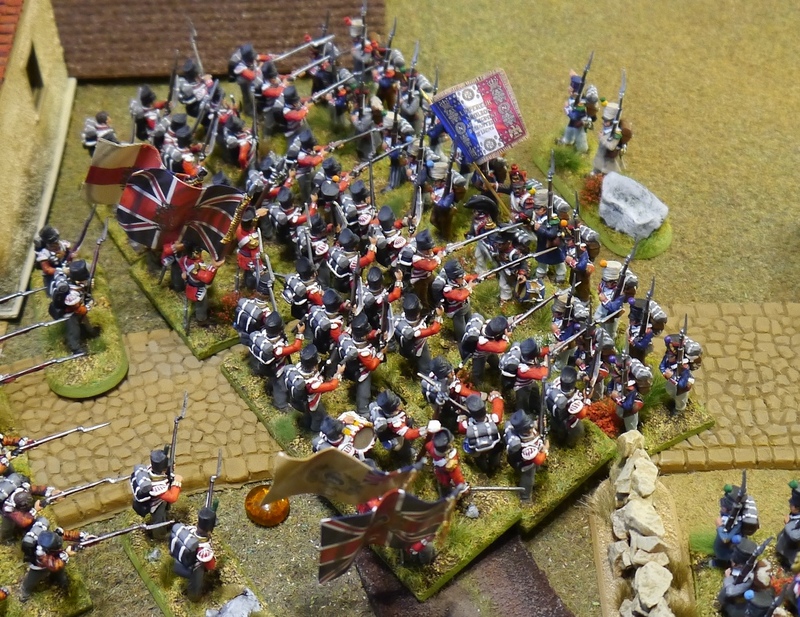 The British (played by me) were rather more numerous, having both their core army and a strong support of black Brunswickers (at the top of the picture, positioned on the British left). 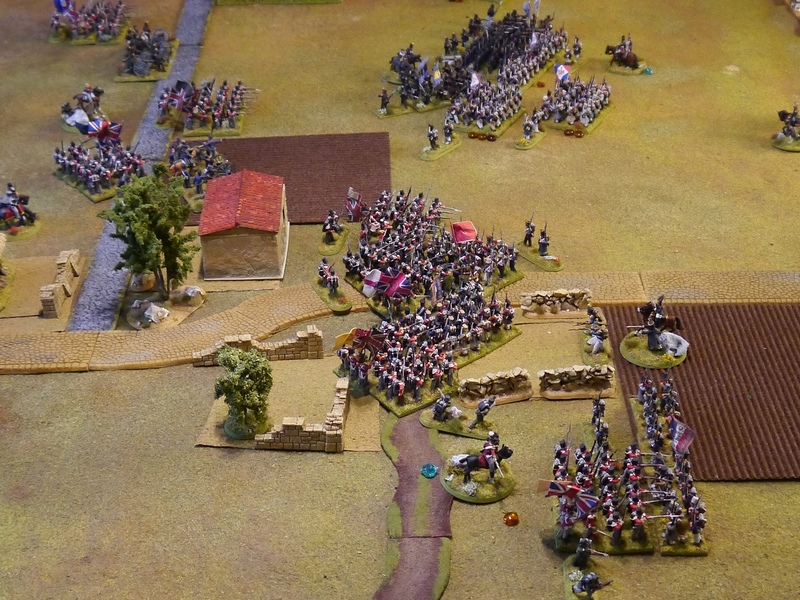 Thus they decided to attack while the French were waiting for reinforcements, sending six batallions of infantry to the village on the British right and the Brunswickers forward. 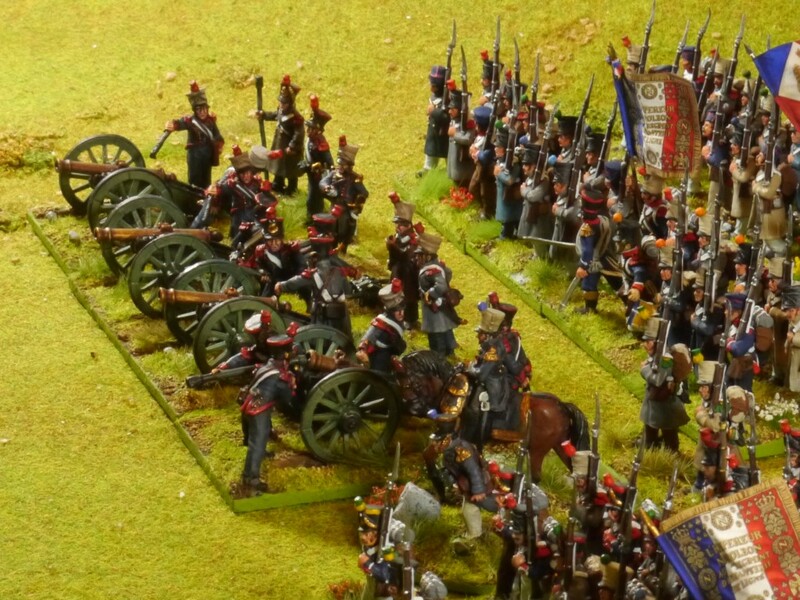 After an at first inconclusive artillery duell fought in the centre the French battery was forced to limber, motivating the Brunswickers to attack the French right flank. 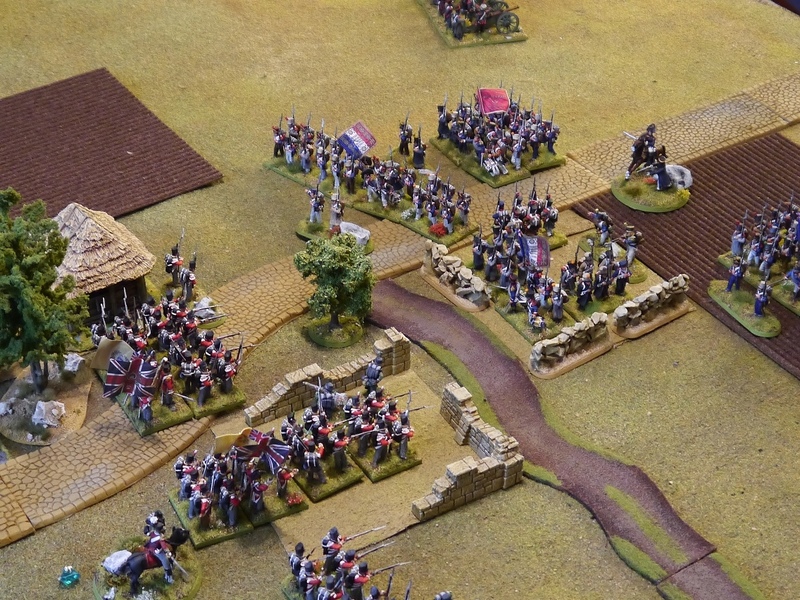 Meanwhile, in the village a desperate run for the buildings had began, with four French and six British batallions racing for the best starting positions for the coming street-fight. ..and engage (sorry for the blurred picture, my hand was trembling because of the shaking ground, beaten by the thundering hooves of the ferocious Brunswick horses). 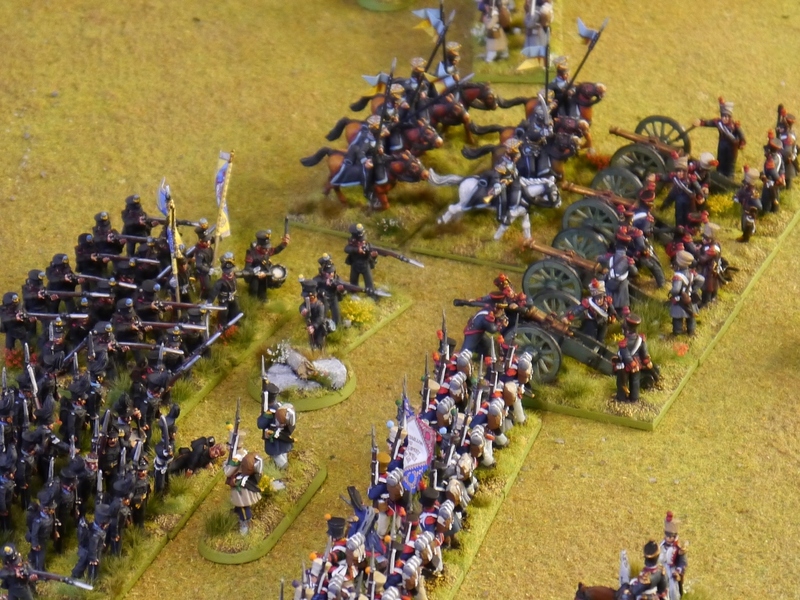 The cavalry was recieved by a fierce cannonade that crippled the unit, rendering it useless for the rest of the game. But it had reached its goal, riding over the cannons and sending the French battery to oblivion. 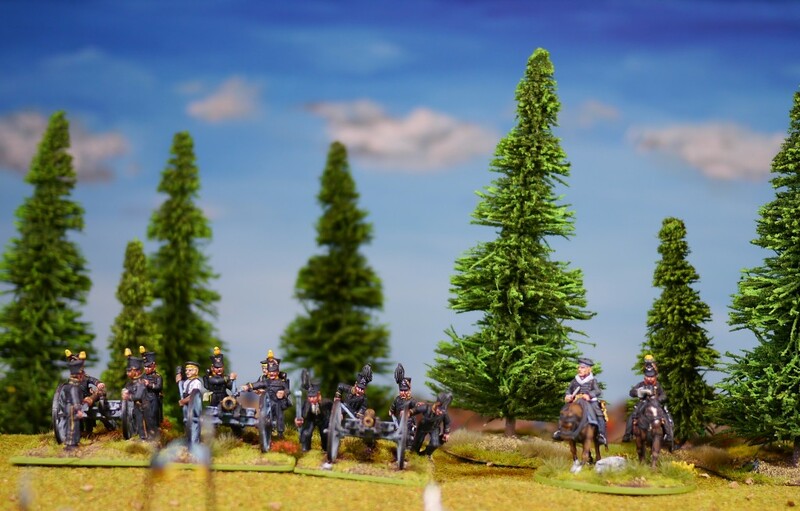 …the battalions had come to grips – and rather tight ones at that. 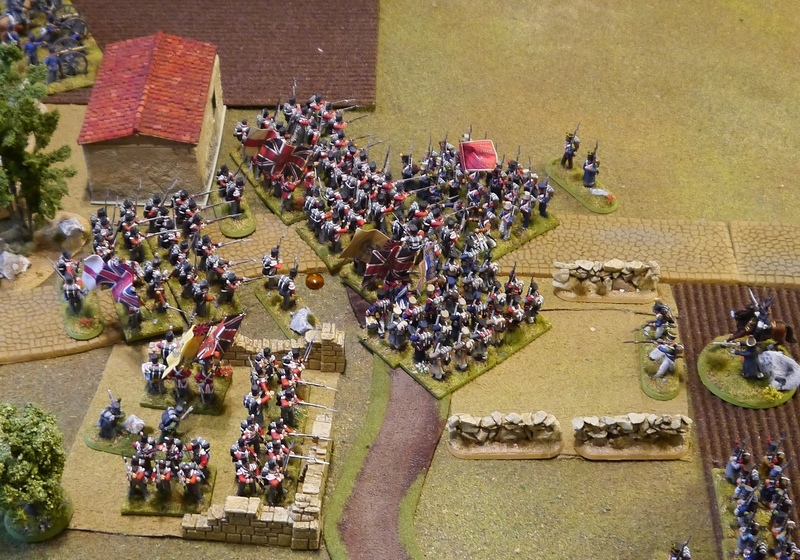 While the first fight saw a French batallion surrendering to the superiour numbers of the British, soon more French joined in, blocking the retreat and thus annihilating one of the British “Buff”-batallions. 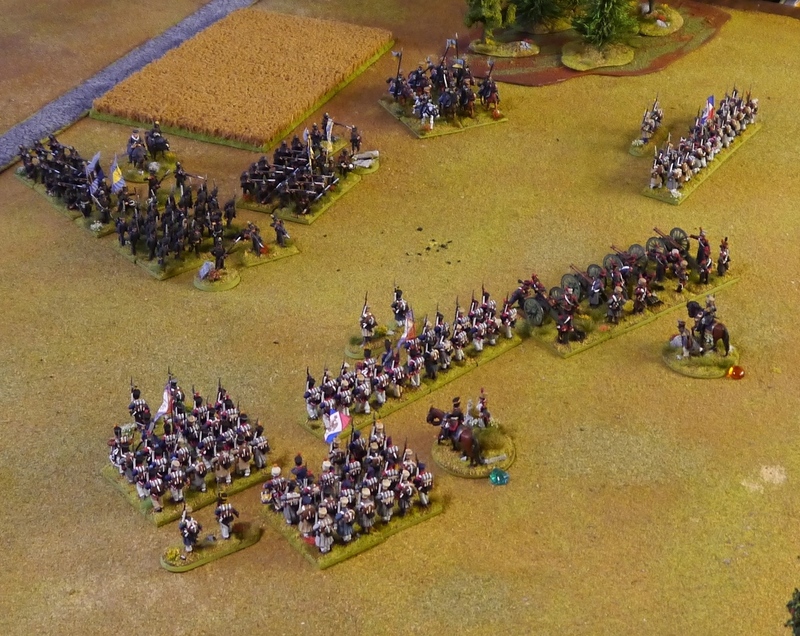 …continued to pepper the French centre, preparing the way for the Brunswick infantry which finally engaged the weakened units. 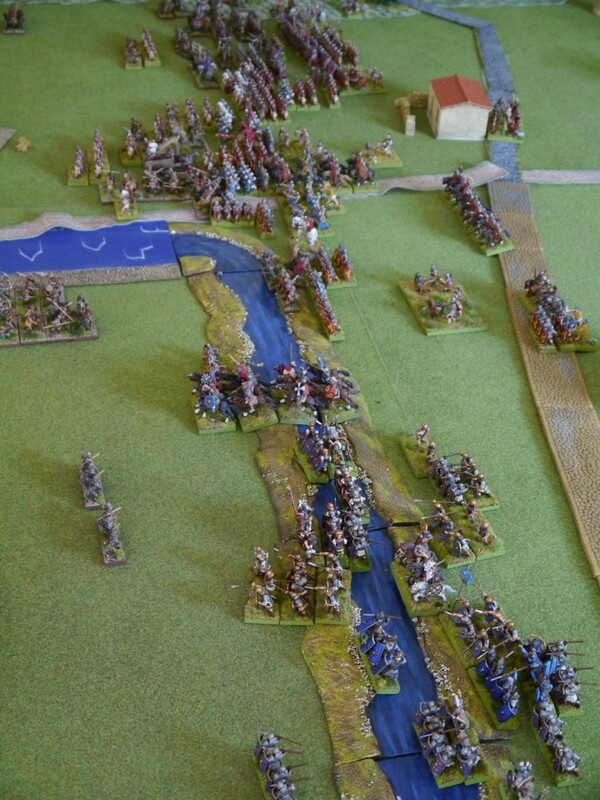 …mercilessly clashed on the Brunsickers (who failed in their attempt to form a square) and drove their battered cavalry off and away. 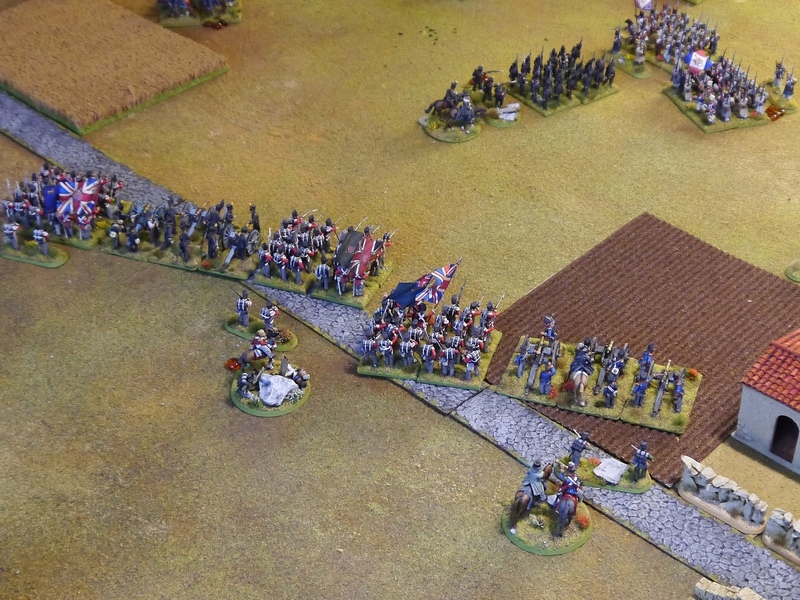 With one of the batallions vanishing in the thunderous attack and another one just holding out with its last will to stand, it started to look rather bleak for the British. 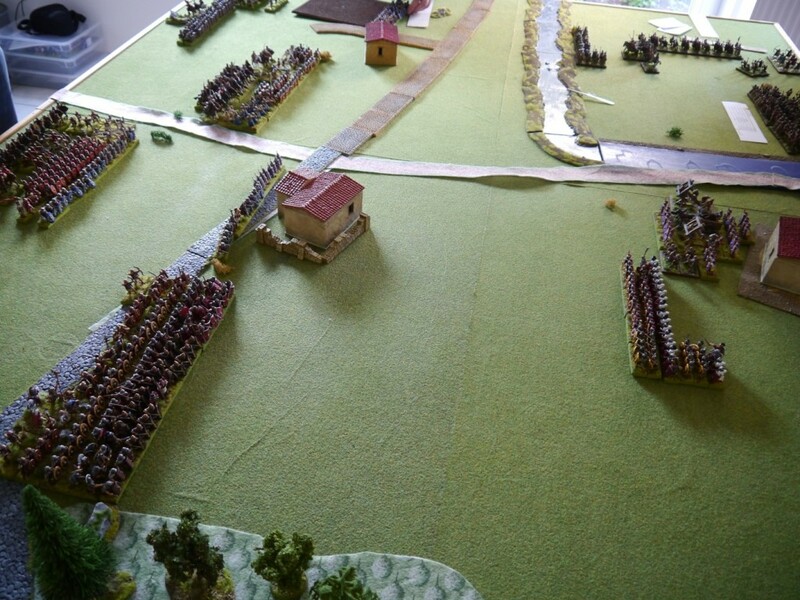 But luckily on their right flank the numbers had finally told and the village was conquered, giving the room for mounting another attack on the centre. …this army was far from breaking. 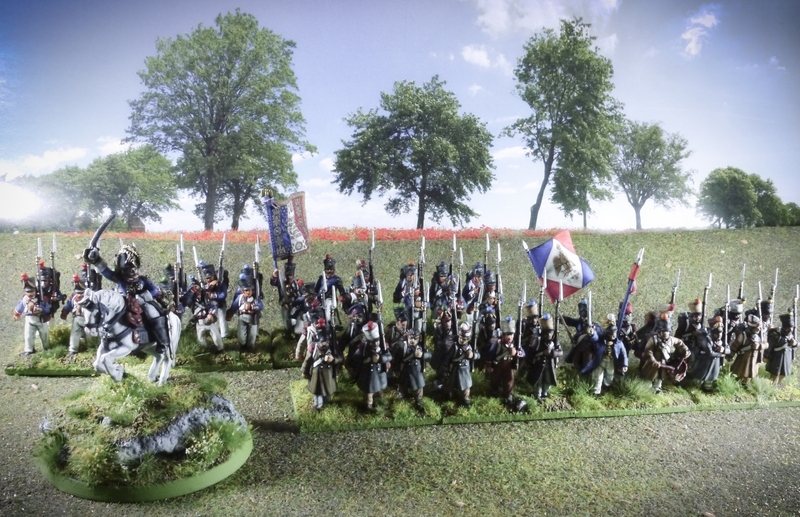 The same could not be said for the French, who decided at their first morale test that it would be wiser to fight another day, thus leaving the field to the British. Certainly the fate of the French was sealed by the late arrival of their reserves. But this was at first not as obvious as it seems in retrospect. In fact the game was full of suspense and could at several points have taken a rather different path. Thus it was highly enjoyable, and I thank Bodo very much for not only letting me win (always a nice gesture when the host is inaugurating a newly painted army) but also for this great game! 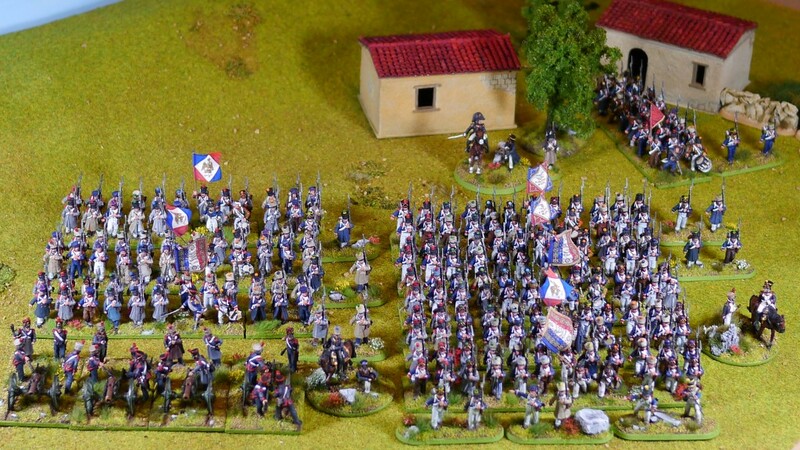 For me it once again proved that Lasalle is one of the best wargame-rules around. 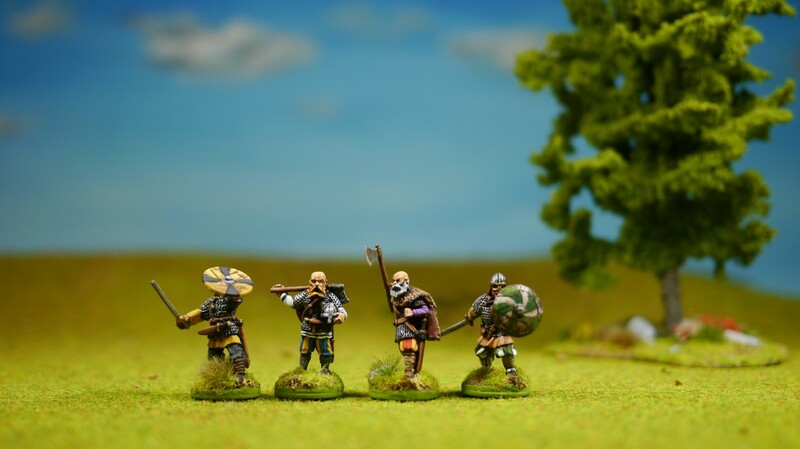 With its elegant game-flow and its simple but coherent mechanisms it lets you concentrate on the battlefield more than on the rulebook and it produces both credible results and interesting, suspense-packed games. 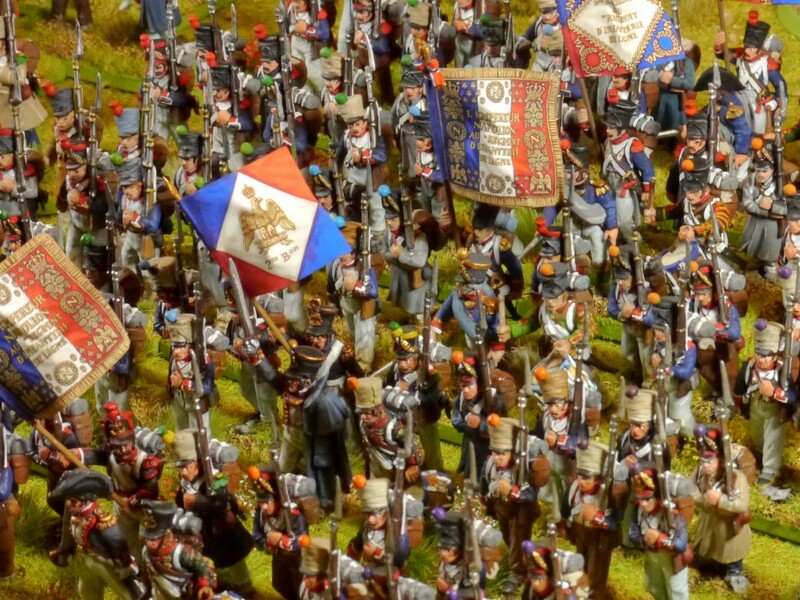 Thus with these two armies now in the field, I’m going to add each a second brigade as reinforcements: Heavy cavalry for the British and elite infantry for the French. But more of this some other time. 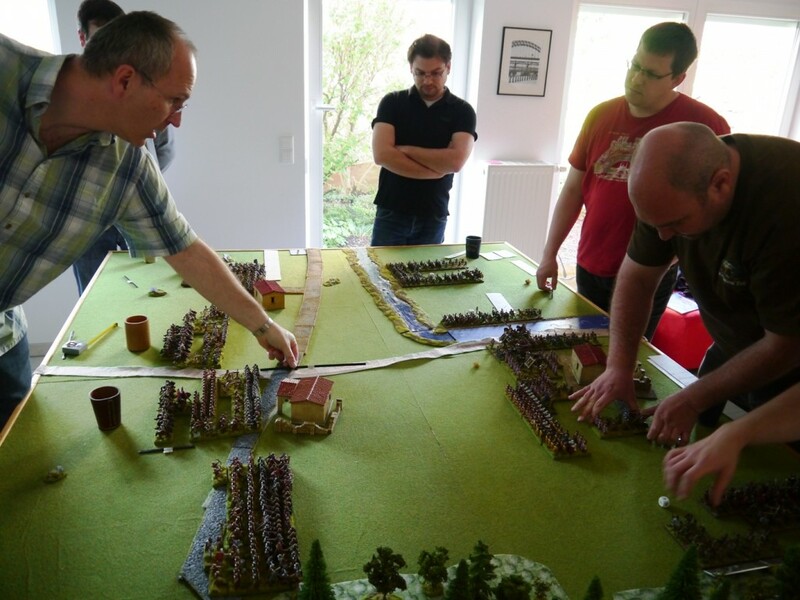 Our club, the Ulmer Strategen, has an annual gaming event: The AttritiCon. This was held last weekend, and it really was a great success. 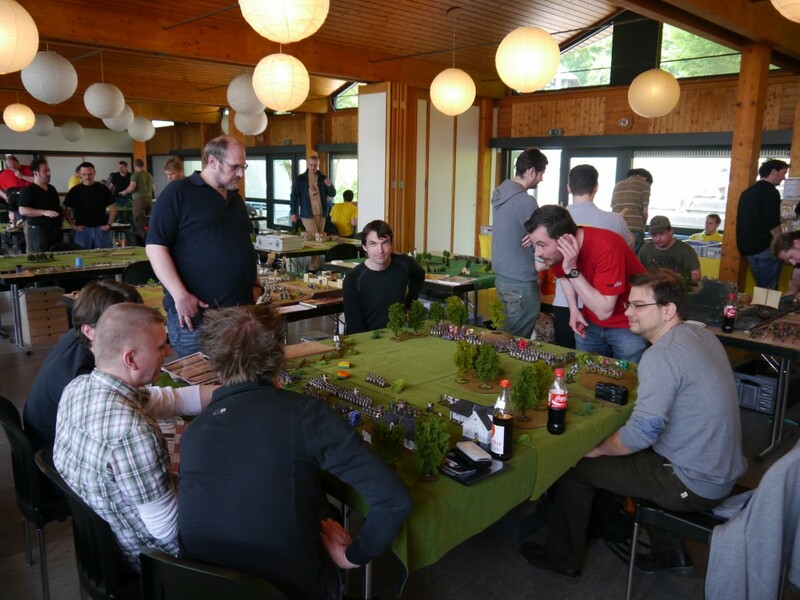 With some 80+ gamers playing DBMM and FOG tournaments as well as many participation games, it really was a joyfull event with a great selection of what our hobby has to offer. There are many more pictures to be found here, alas I have to appologize that the text that goes with them is written in German. 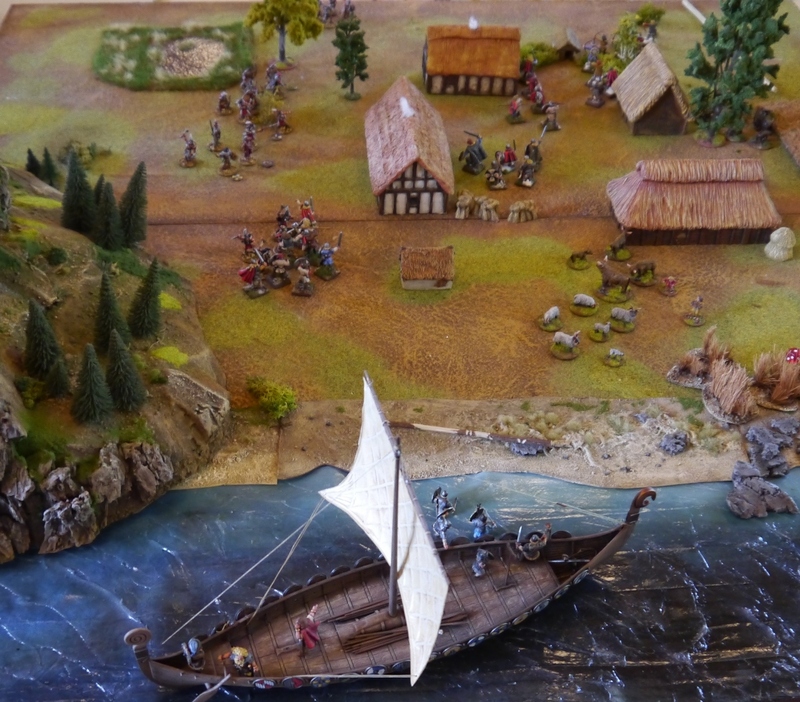 I took part in the DBMM tournament, but I also used the time between games to both learn Impetus and play a round of SAGA – the last on a very beautiful table presented by our friends from Heidelberg. 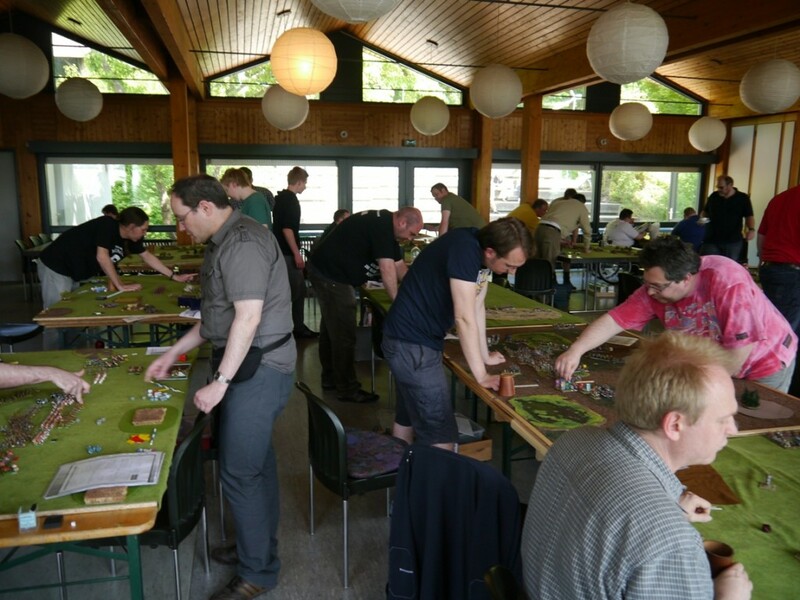 I did rather well at the DBMM-tournament and ranked fifth out of ten players – considering the lack of gaming practice and the complexity of the rules this position was more than I could have hoped for. Also, two of the four games were really good fun. 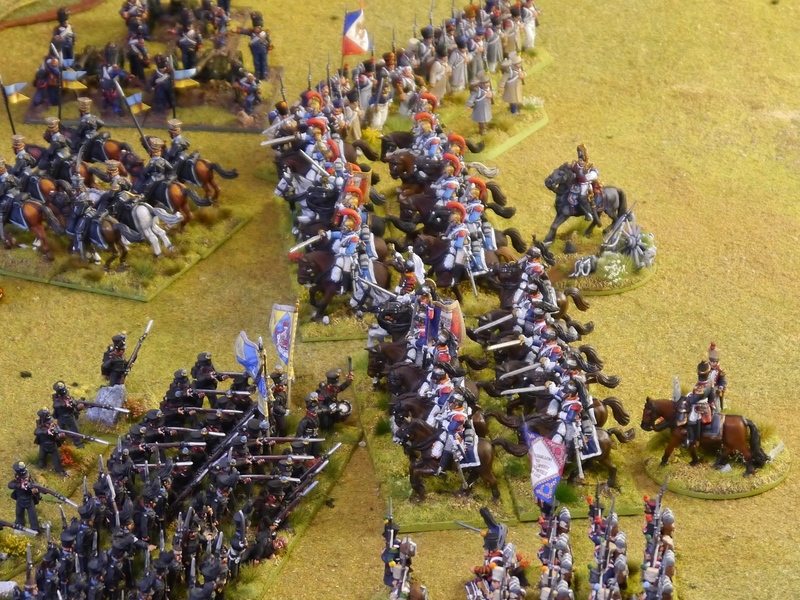 As for the other two games my fun was a little bit tarnished – not by the fact of winning or loosing, but by the rather strained and ambitious attitude of my opponents. I don’t blame them, it WAS a tournament after all, but it became one again clear to me why I’m not very attracted to tournament games any more. After all, I have more than enough competition in my job. I enjoy it much more when the tension of a game stems from the unfolding narrative, casting its spell over the players, rather then from the strained nerves and mikro-optimizations of tournament-competitors. So I guess I’ll certainly continue to play DBMM, but I think I’ll keep away from tournaments for a while. Still it has been a great weekend, and there were so many nice people and so much hobby-talk that it more than compensated for the minor annoyances. And the oppertunity to play Impetus may have marked the start into this new gaming system – at least it sounds and feels very promising. 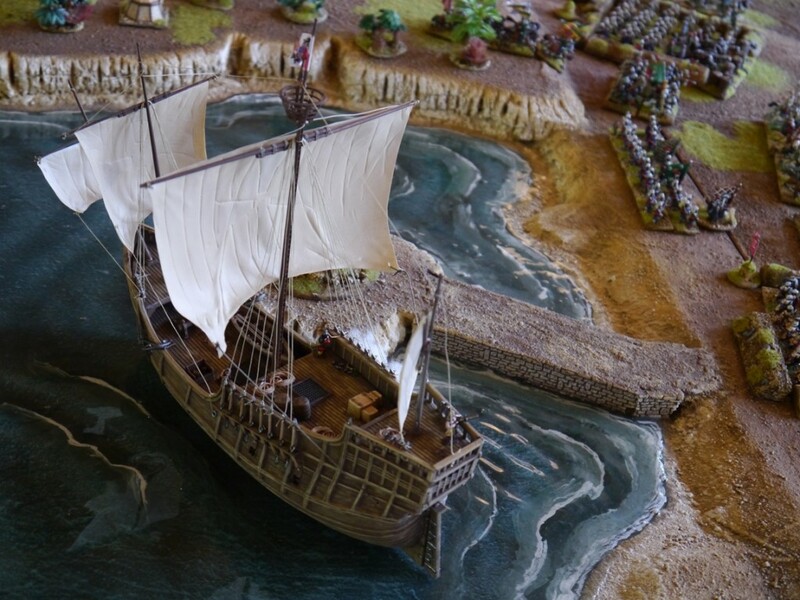 One of the greatest experience in our beautiful hobby is amassing hundreds of painted miniatures and refight a historical battle. This is what we did at the 1st May, which is a bank holiday in Germany. 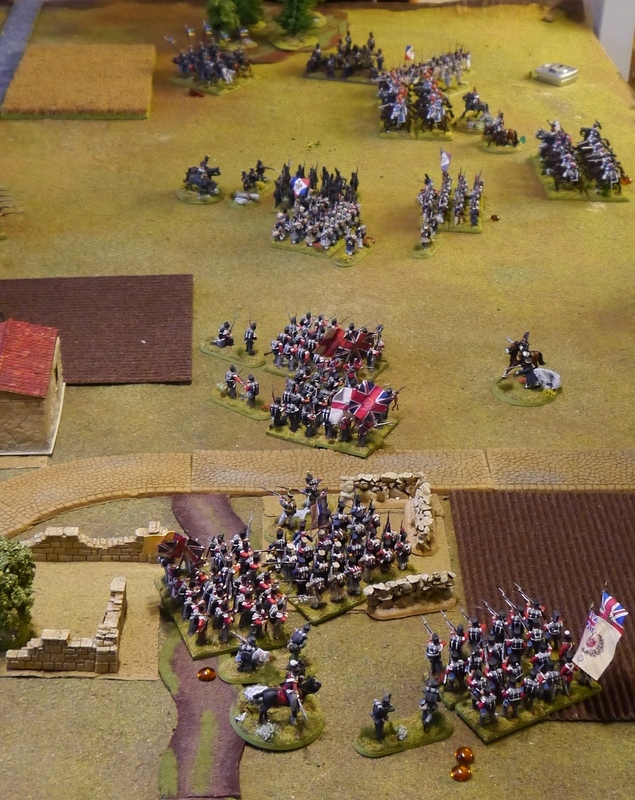 We met at Neils home, who had already prepared the battlefield, and unpacked about 600 28mm figures (of which about two thirds were from my collection and another third from Norberts). 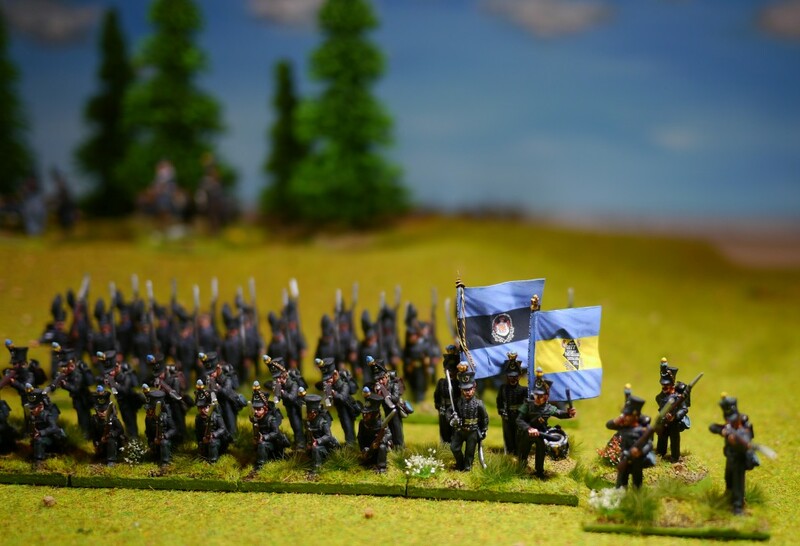 Both Norbert and me had been painting and basing feverishly in the last weeks in order to field the required troops. 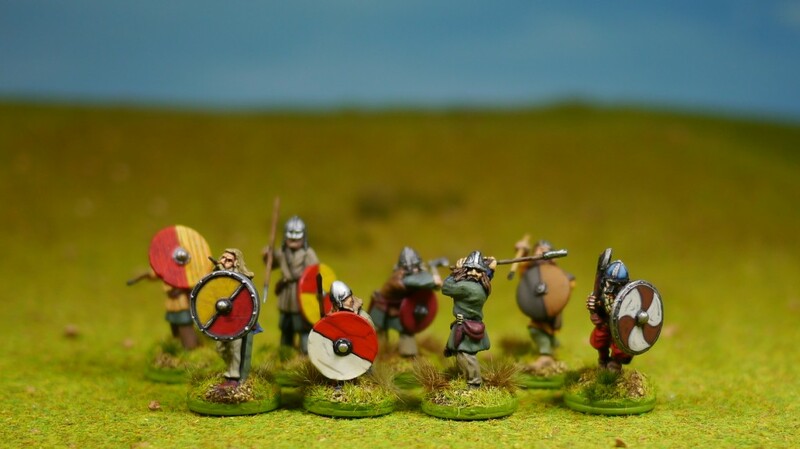 The research has been done by Neil, who used the historical texts of Tacitus as well as the brillant books of Stephen Dando Collins to recreate both the battlefield and the order of battle as exactly as possible. 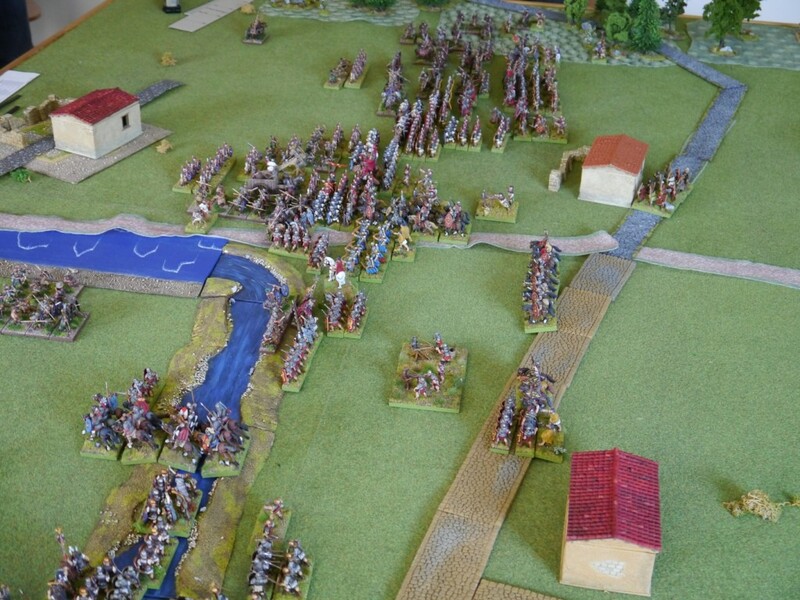 The historical event we recreated is the Battle of Bedriacum, also called the second battle of Cremona. It was fought during the civil war 69 AD in the year of the four emperors and was the decisive victory for Vespasian over Vitellius, placing the Flavians firmly on the throne. Cornelius Tacitus (The histories, book three, 1-35): Luck and loyalty attended the leaders of the Flavian interest as they proceeded to form their plan of campaign. They had met at Poetovio, the winter-quarters of the Thirteenth Legion. There they debated [...]. The keenest advocate of war, Antonius Primus, urged that speed would be helpful to themselves and fatal to Vitellius. [...] Antonius began his lightning invasion of Italy with the help of detachments from the cohorts and a part of the cavalry. [...] These steps were taken without the knowledge of Vespasian or else against his instructions, for his orders at this time were that the advance was to be halted at Aquileia to allow Mucianus to catch up. [...] The same advice was conveyed in repeated dispatches from Mucianus, who, while ostensibly advocating a bloodless victory, the need for keeping casualties down and so on, was in fact greedy of glory and anxious to monopolize any distinction the campaign afforded. However, the great distances involved meant that official instructions arrived when events had already taken place. [...] Vitellius had called for reinforcements from Britain, Gaul and Spain. A war of boundless havoc seemed imminent. 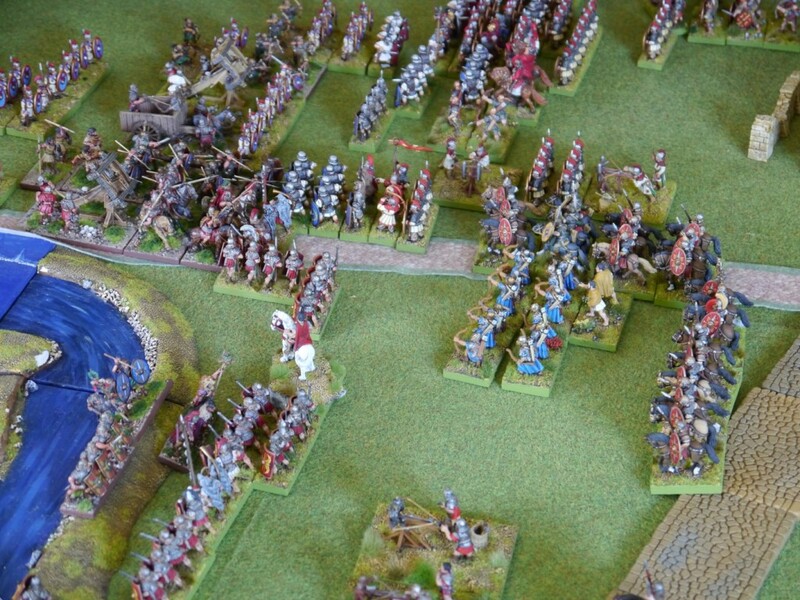 But Antonius, anticipating this, snatched a timely victory by forcing an engagement. 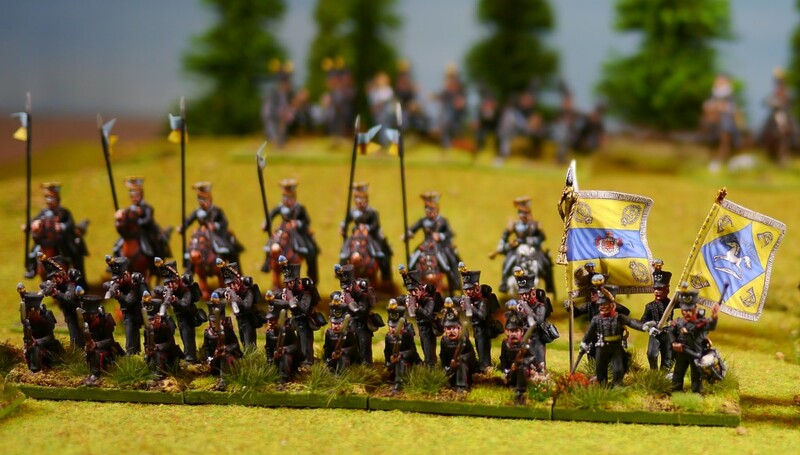 A two days’ march from Verona brought him to Bedriacum with the whole of his army.[...] 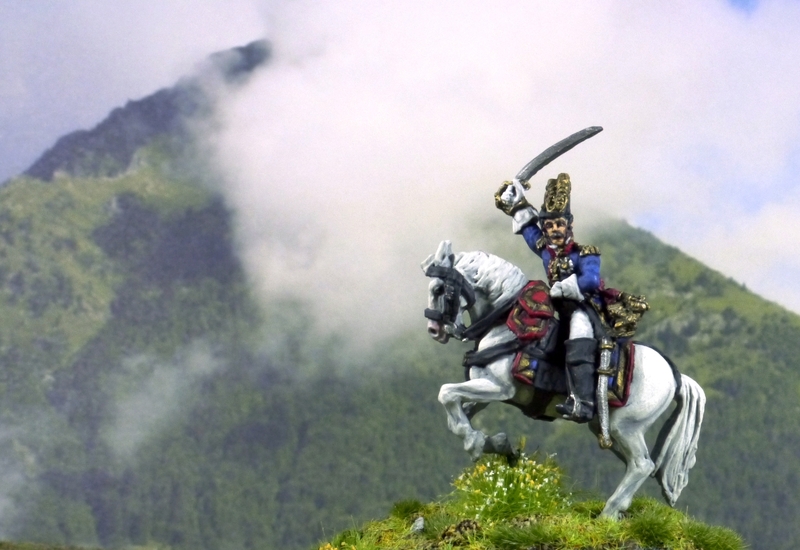 It was approximately 11 a.m. when a rider galloped up with the news: the enemy were approaching, headed by a small advance party, and movement and tumult could be heard over a wide area.[...] 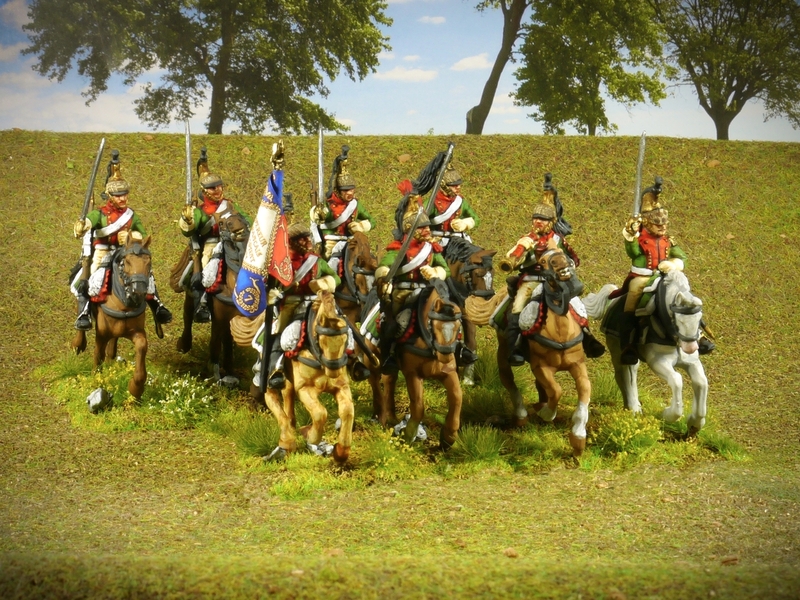 Four miles from Cremona, the glint of standards marked the approach of the Hurricane and Italian Legions, which had marched out as far as this during the initial success of their cavalry. But when luck turned against them, they did nothing.[...] 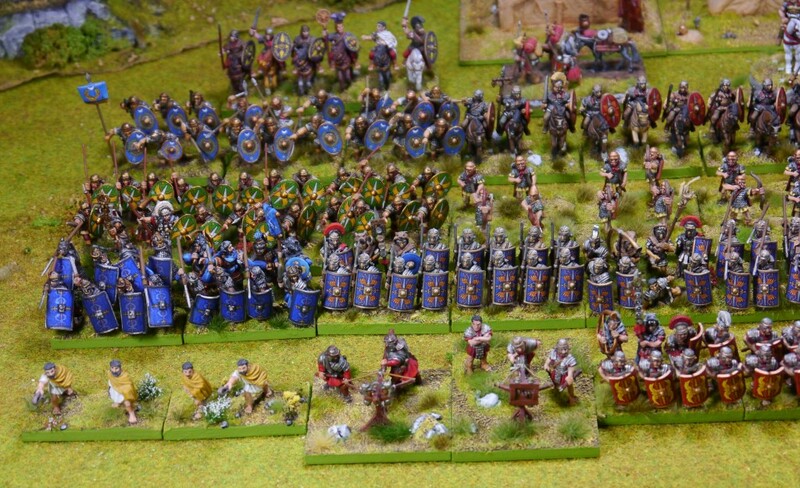 As the light faded, the Flavian army arrived in full strength. 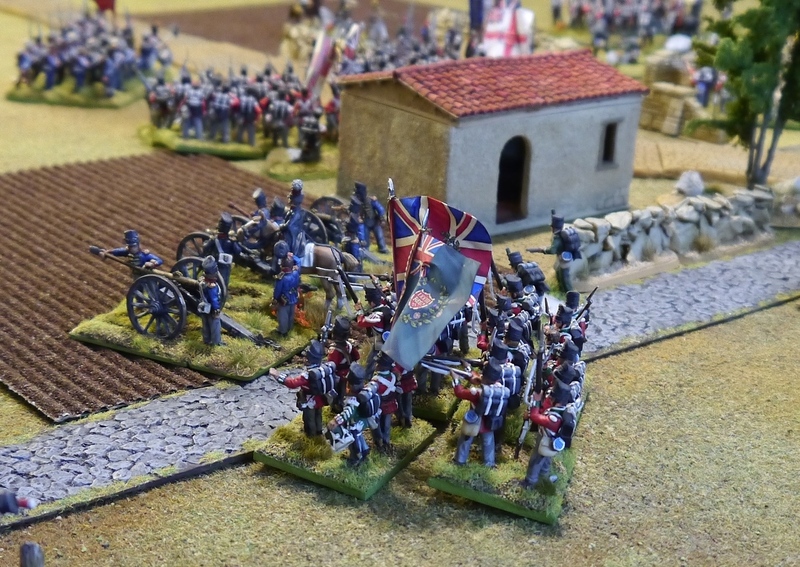 Once they began to march over the heaps of dead and the fresh traces of bloodshed, they thought that the fighting was over and clamoured to press on towards Cremona to receive, or enforce, the surrender of the beaten enemy. [...] At about 8.30 p.m., by which time the Flavians were ready and in position, the Vitellians hurled themselves violently on their foe. That is the starting point of our battle. Since it was already dark, we simulated the confusion by both giving each army only a confined space to deploy and (in accordance with the night-fight rules in DBMM, the ruleset we used) limiting the visibility to 160 paces (12cm) – making both movement slow and constraining the range of fire for the artillery. Here is the setup with a little stream(dug for the drainage of the fields) on the Vitellian side and the street to Cremona on the Flavian side. ...which is eagerly awaited by the Flavians. The lines clash and the battle commences. Tacitus continues: Throughout the night, the fighting was varied, indecisive and bitter, inflicting destruction on either side in turn. Clear heads and strong arms availed nothing, and even eyes were helpless in the dark. On both sides weapons and uniform were identical, frequent challenges and replies disclosed the watchword, and flags were inextricably confused as they were captured by this group or that and carried hither and thither. 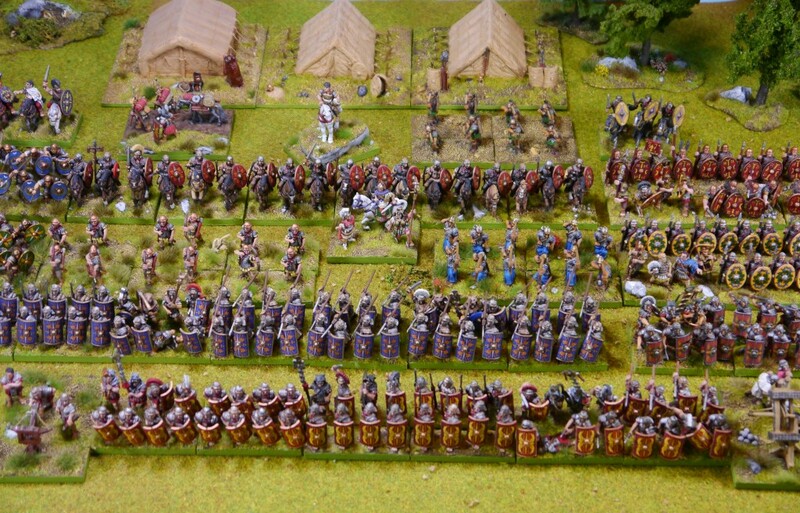 The formation under heaviest pressure was the Seventh Legion recently raised by Galba. Six centurions of the leading companies were killed, and a few standards lost. Even the eagle was only saved by Atilius Varus’ desperate execution upon the enemy and at the cost, finally, of his own life. Antonius stiffened the wavering line by bringing up the pretorians. After relieving the Seventh, they drove the enemy back, only to be driven back themselves. 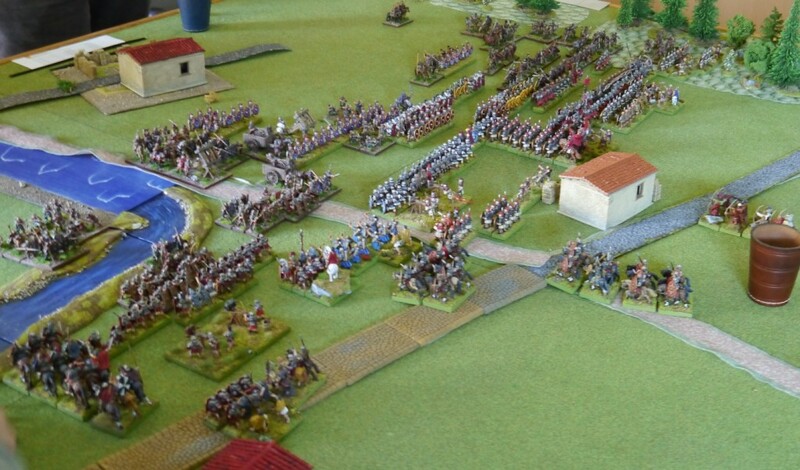 In the Flavian centre, the pretorians advance in column. 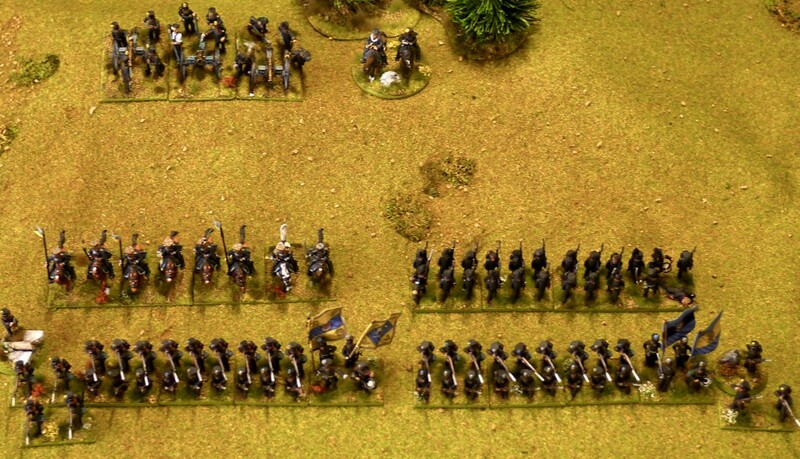 On their right flank, a ficious fight in the forrest begins. 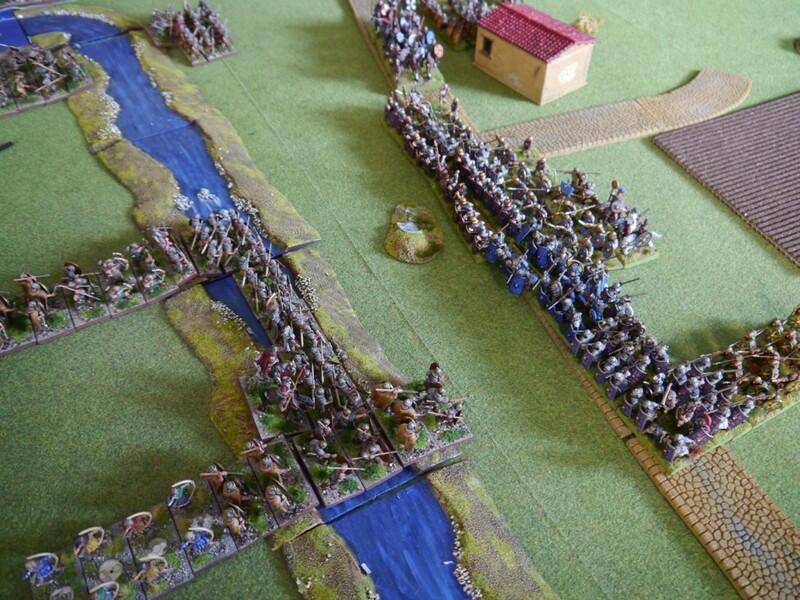 The reason for this was that the Vitellians had concentrated their artillery upon the highway so as to command an unobstructed field of fire over the open ground. 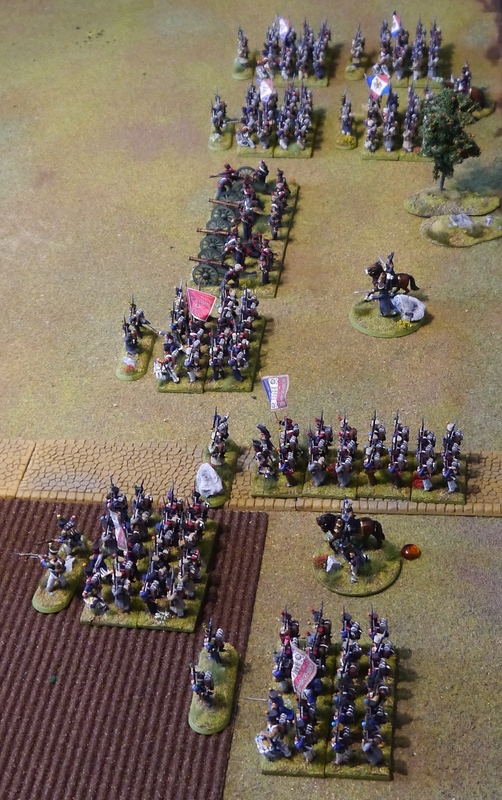 Their shooting had at first been sporadic, and the shots had struck the vine-props without hurting the enemy. 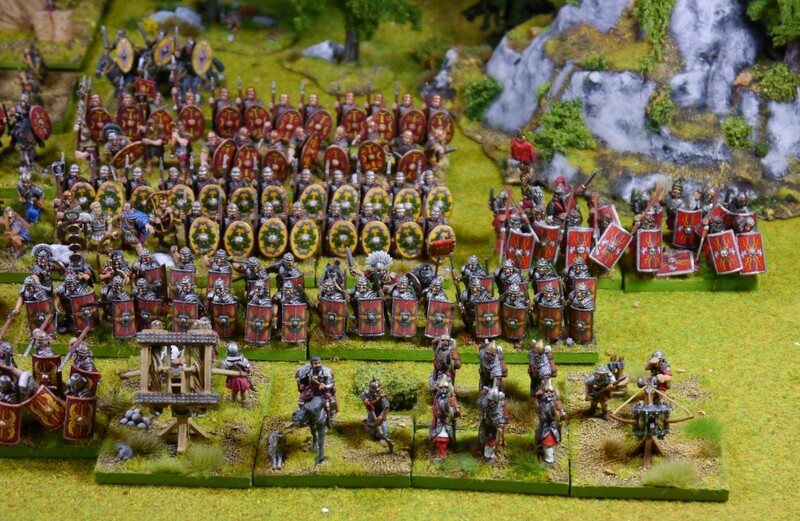 The Sixteenth Legion had an enormous field-piece which hurled massive stones. These were now mowing down the opposing front-line, and would have inflicted extensive havoc but for an act of heroism on the part of two soldiers. They concealed their identity by catching up shields from the fallen, and severed the tackle by which the engine was operated. They were killed immediately and so their names have perished, but that the deed was done is beyond question. We actually replicated this event by smuggling a Psiloi behind enemy lines, and this “commando” was actually able to destroy an artillery! Neither side had had the advantage until, in the middle of the night, the moon rose, displaying— and deceiving— the combatants. 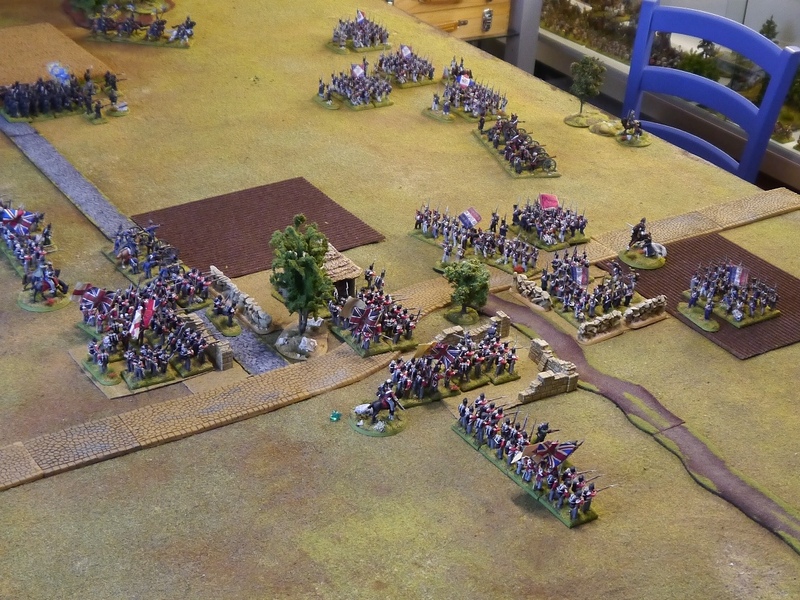 But the light favoured the Flavians, being behind them; on their side the shadows of horses and men were exaggerated, and the enemy fire fell short though the gunlayers imagined that they were on target. But the Vitellians were brilliantly illuminated by the light shining full in their faces, and so without realizing it provided an easy mark for an enemy aiming from what were virtually concealed positions. With the rising of the moon, we had better visibility. Yet it did not change much, the hand to hand fighting was already going on. 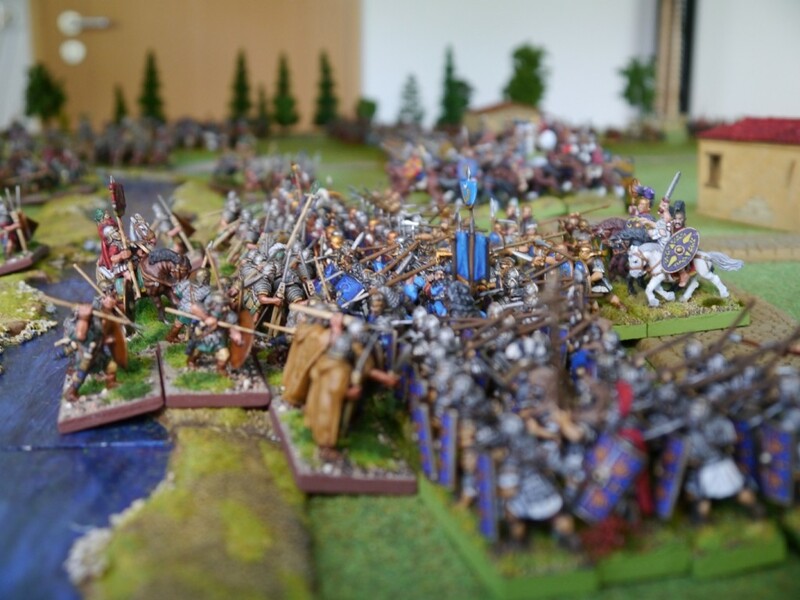 On the left Flavian flank the Vitellians didn’t have enough time to bring all their troops over the sewer, their lines were thinned, wavered and eventually collapsed. ... while the fighting on the right (top of the picture) is rather balanced. Antonius and his men could now recognize each other. So he seized the chance of spurring them on, some by taunts and appeals to their pride, many by praise and encouragement, all by hope and promises. Why, he asked the Pannonian legions, had they taken up arms in their resentment? [...] Then he spoke with greater sharpness to the pretorian guards. ‘As for you,’ he said, ‘you are finished as soldiers unless you beat the enemy. What other emperor and what other camp is there to which you can transfer? There, among the foe, are the standards and equipment which are really yours, and for the beaten the sentence is death. Everywhere there were cries of enthusiasm, and as the sun rose, the Third greeted it with cheers in accordance with Syrian custom. This led to a vague rumour (perhaps intentionally spread by the Flavian commander) that Mucianus had arrived and that the cries were greetings exchanged by the two armies. 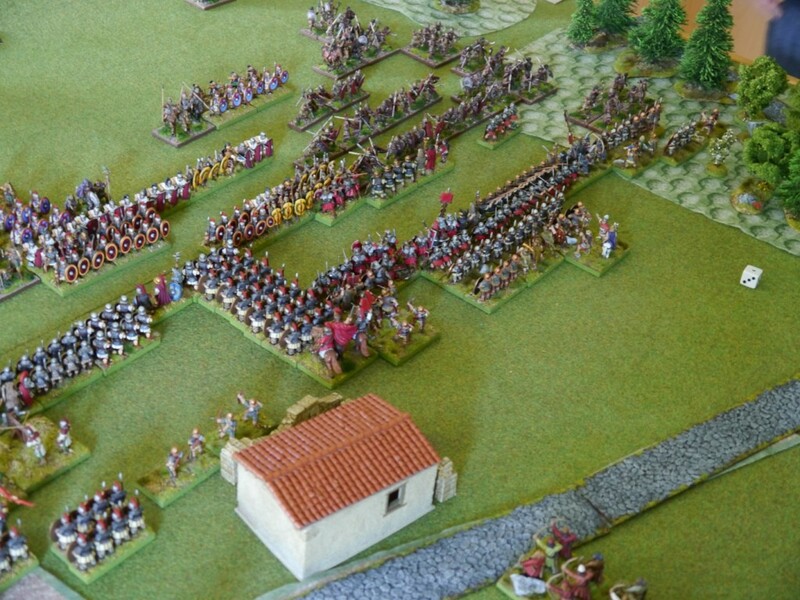 The men moved forward under the impression that they had been reinforced by fresh troops, the Vitellian line being now thinner than before, as one might expect of a force which in the absence of all leadership bunched and spread according to individual impulse or panic. When Antonius sensed that the enemy were reeling, he proceeded to throw them into confusion by the use of massed columns of troops. The loosely-knit ranks broke, and could not be closed again owing to the obstacles presented by vehicles and guns. Down the long straight road, drawing away from each other in the fervour of pursuit, charged the victors. Norbert as a true "Vietllian commander"
All in all, it was a great success. Neil and his wife Amanda were perfect hosts as always (many thanks! ), for Norbert and me it was great to see our long prepared troops finally in action and our co-generals Arnim, Florian, Thomas and Kai were very pleased to play with 28mm figures, which all the same proved to be quite a challange since they normally play in 15mm and had thus to switch their planning to these rather different ranges and appearances. 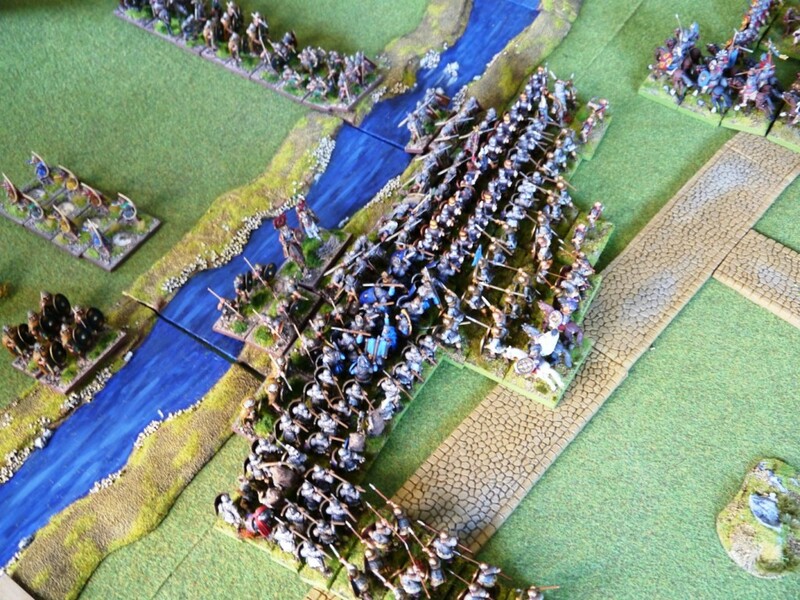 DBMM proved the right rulesystem for this battle, and we were very surprised that in spite of the massed troops and the slower movement the battle was over in less than three hours. 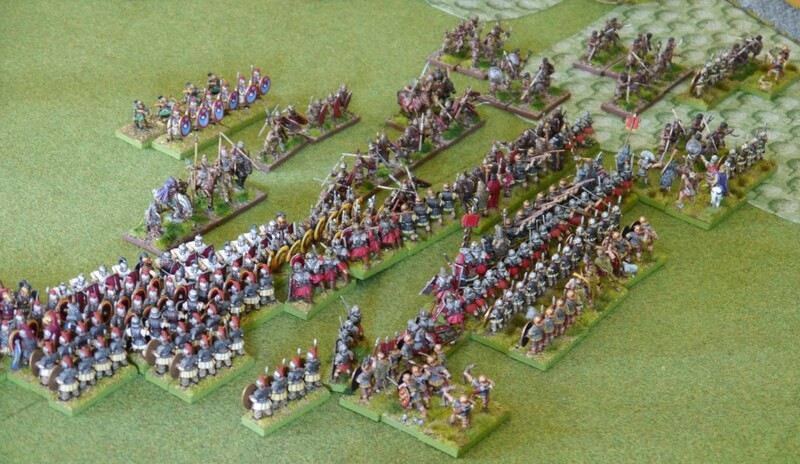 This gave us the oppertunity to play another, more generic battle with the same armies, which also was very enjoyable. What a great day! Yes, it was quiet around here. Too quiet indeed. But not in my painting cellar I can assure you, because there was feverish activity. Only a few days left and a big battle will take place, one which will see many figures of mine and which I’m very much looking forward to. Firstly it surely will be a great event all by itself. But it also is a big premiere for a lot of the figures involved. AND the figures involved are not your everday figures – at least not for me. About 20 years ago I only painted 1/72 plastics and even if painting was among my favorite activities then I actually didn’t do it very often. You know – smelly humbrol colours that required braincell-killing chemicals to clean your brushes and provided great oppertunities to cover yourself in funny colors every time one of the paintpot-lids stuck to the pot and when confronted with a screwdriver would at first not move at all and than all at once… Well, you get the idea. Then two things happened: I was introduced to painting with acrylics by a long out of press booklet from a long out of business company (Hobby Products – whose miniature-range is now owned by Black Hat I believe) AND I’ve discovered Wargames Foundry and it’s 28mm Romans in an also sadly long gone miniature shop in Augsburg, Germany. 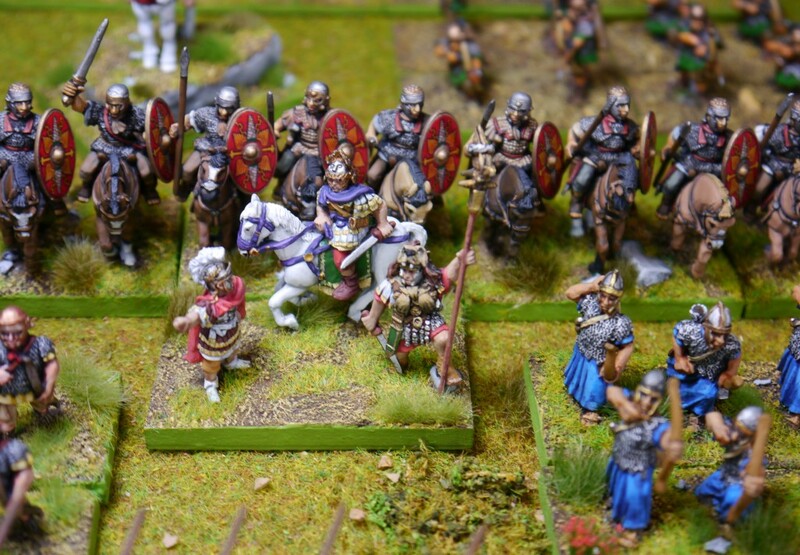 Of course the Romans were sculpted by the Perries, and of course I stuck with them. 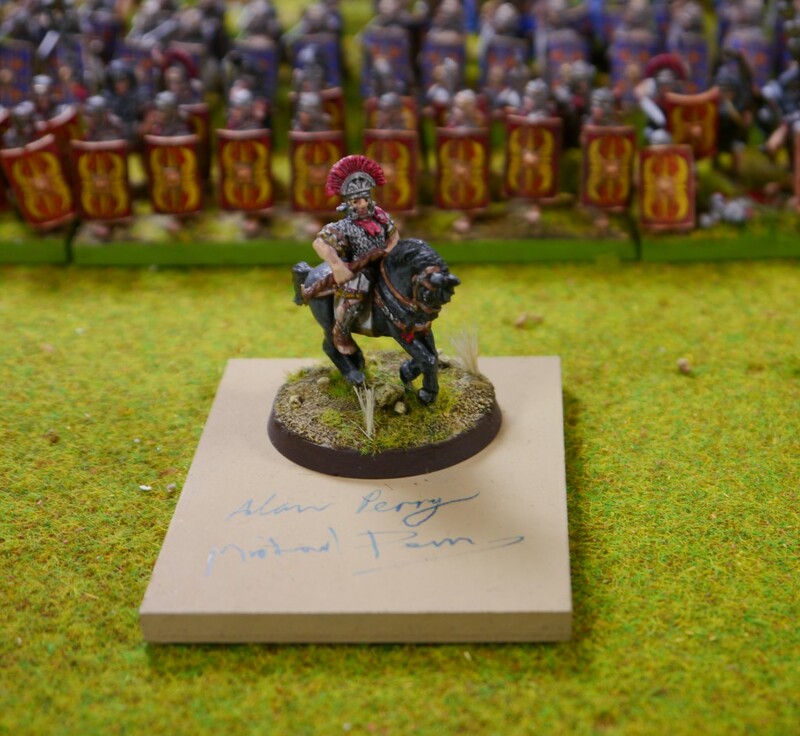 The strange thing is that although since then I had bought many more Romans (first only from Foundry, but later also from Warlord Games) both painted and unpainted (I actually painted quite a lot of them myself), I really did not game with them. 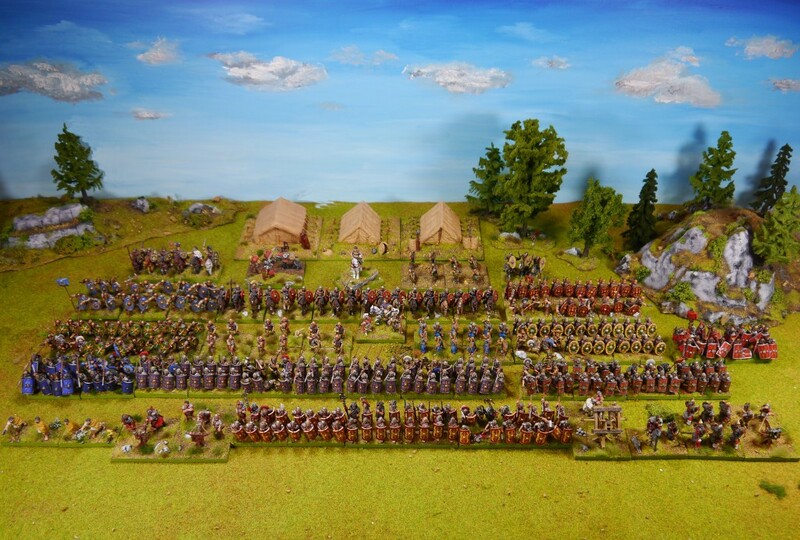 I now have many much newer armies which I’ve already campaigned with comparablyoften, but apart from the odd appearance as a DBA army and two DBMM240 battles with only a small part of the army involved my imperial Roman force only grew and grew and has not yet left its tents. 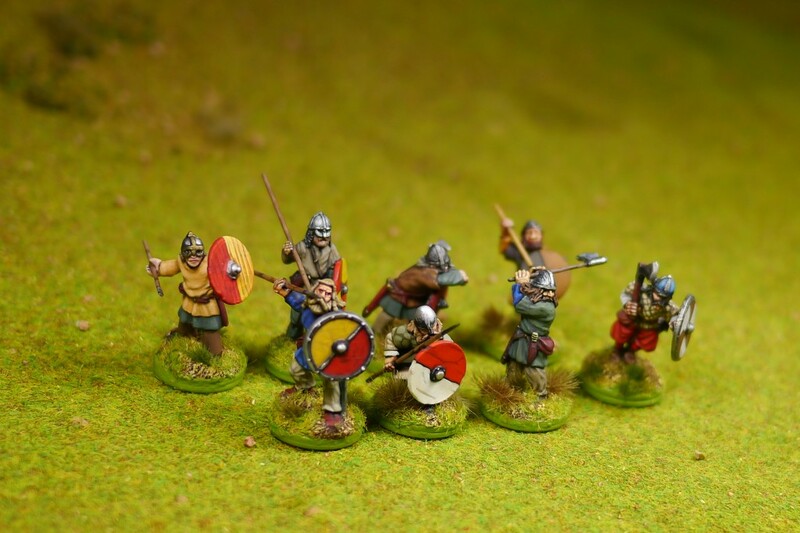 Many units were only partially finished, many of the figures were not based or varnished – things I had worked on for the last weeks and that is why it was so quiet around here. 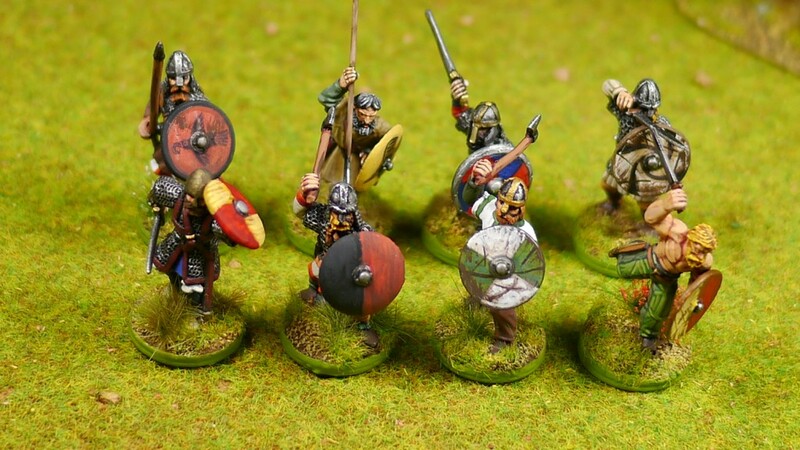 It simply is not fun to write twice a week “I have varnished and painted 5 figures”. In my one year blogging history I have discovered that I’m the “finished unit” or even “finished project” type. There are two or three units that are not finished yet and hopefully will be finished one of theses days, but I don’t want to wait any longer to show them. So here they are. The general waiting to give the signal. And finally, last but defnitly not least, the first Perry figure I’ve ever painted, now signed by both hobby-giants. 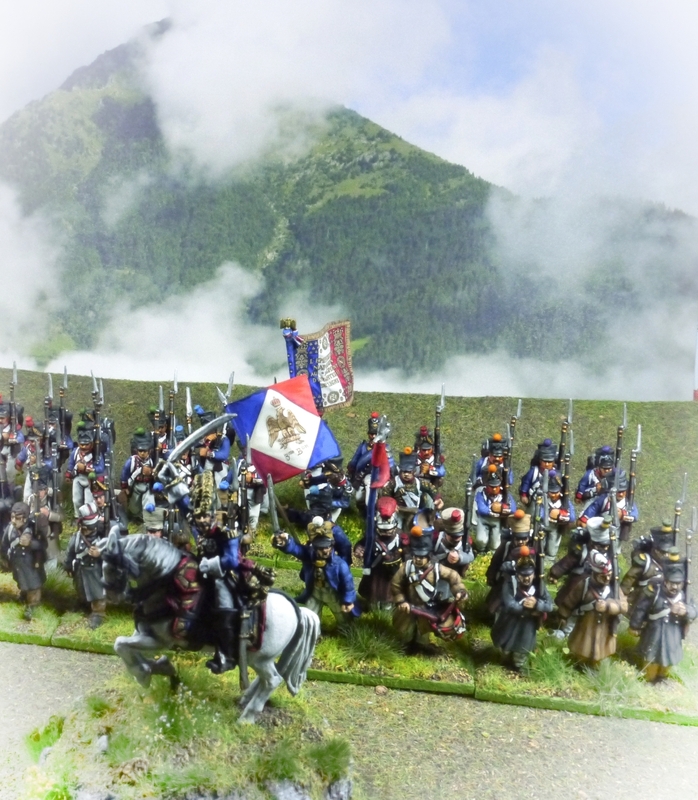 After having finished my British Lasalle Army I fell into some kind of “painters block” and instead of painting I did some cleaning and sorting and made ready some bits and pieces for an online garage sale. If you are interested you can see the first batch of figures here. Some painted figures will be added soon. 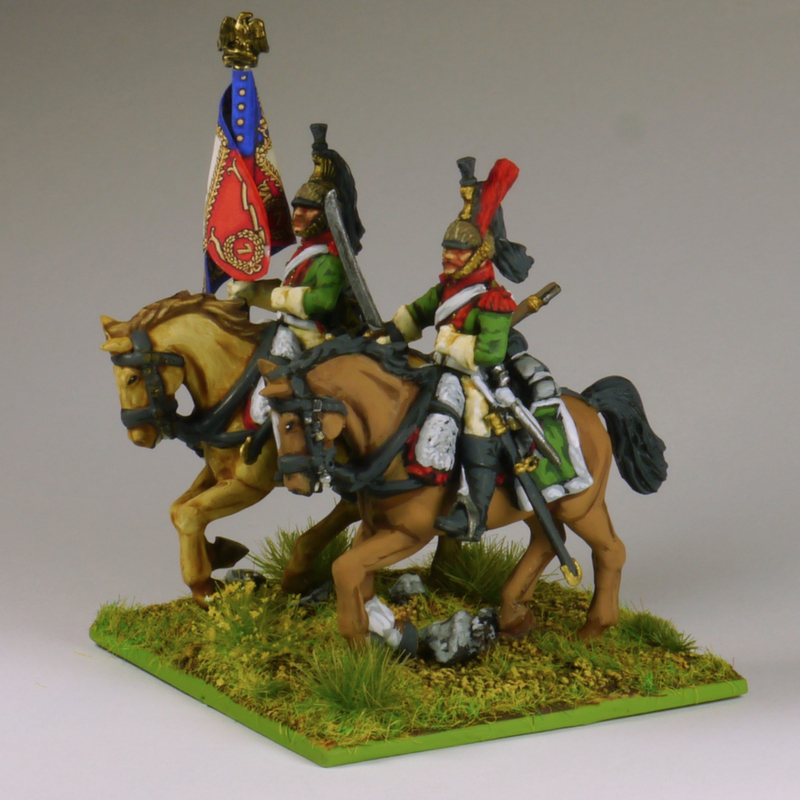 Drop me a note if you care for any of the figures (SirTobi[at]ulmer-strategen.de). …it has a good mass-effect but still has details and character. Well well well, this took longer than I had expected. 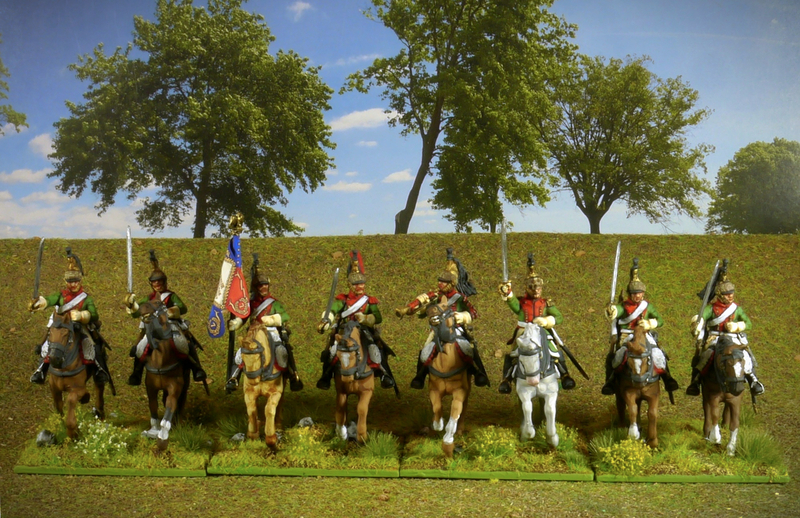 BUT now the Brunswickers as first addiditional brigade for my Lasalle British army are finally completed. 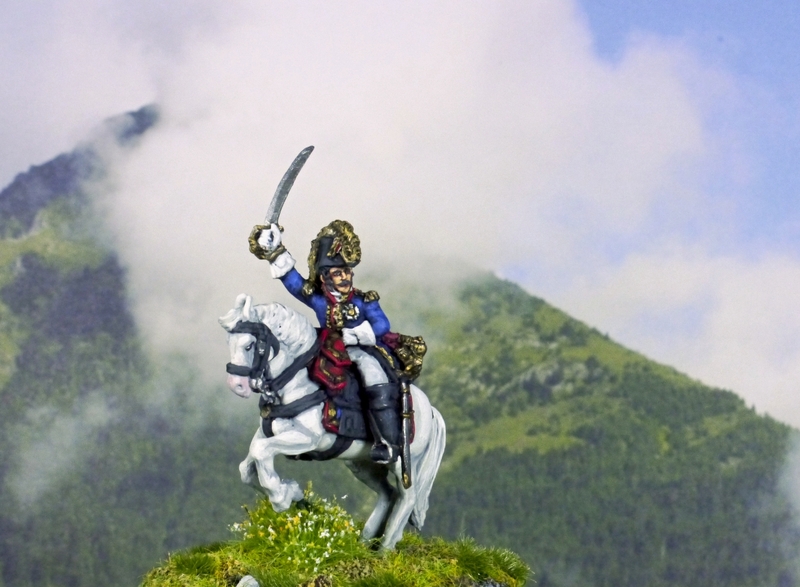 They consist of two line battlalions (which were missing until today), an elite batallion or Leib-Batallion, artillery, cavalry (originally Hussars, but I liked the Uhlans better), artillery, two extra skirmisher bases and of course the command. 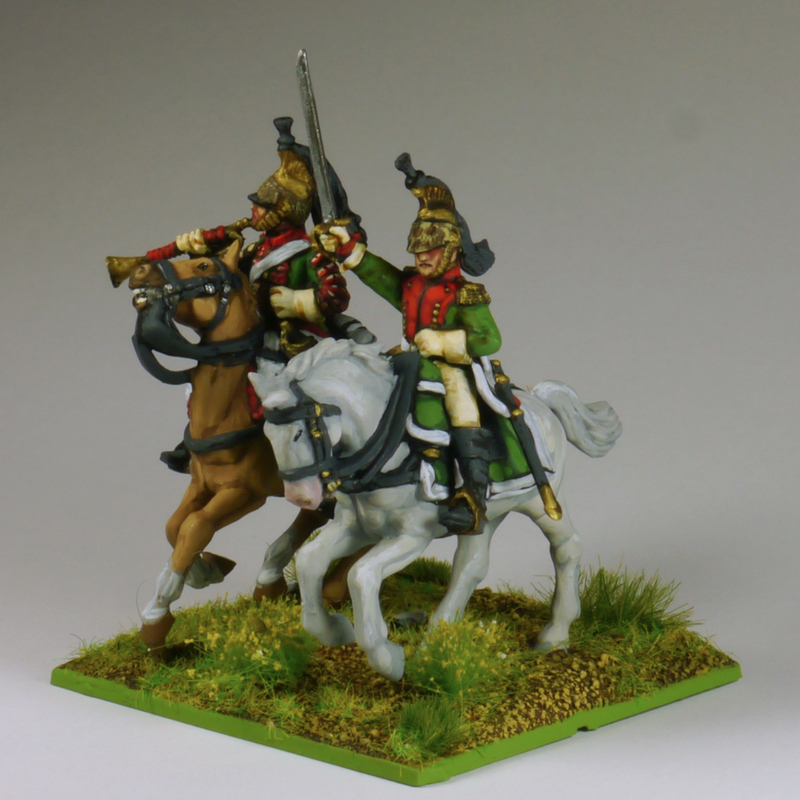 …and the second line batallion under Major von Strombeck. 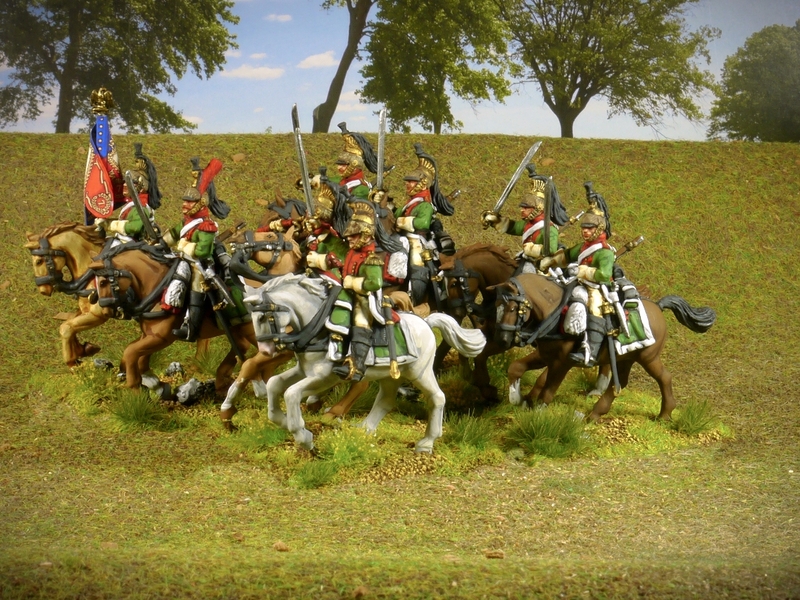 … and the the Uhlan-command (beautiful figures – I may say so, because I did not paint the Uhlans myself). Hobby-life is very busy at the moment. A big event casts its shadow ahead, and while I can’t say too much now (it is meant to be a surprise for the participians), I can say it will be Roman, it will happen on May 1st, and it will be huge. Detailled story telling will follow after the event, for now I’m speed-painting and basing Romans, Romans and again Romans. Since these units are painted for mass-effect, I won’t take pictures of them – that’s why this blog seems to be hibernating momentarily. 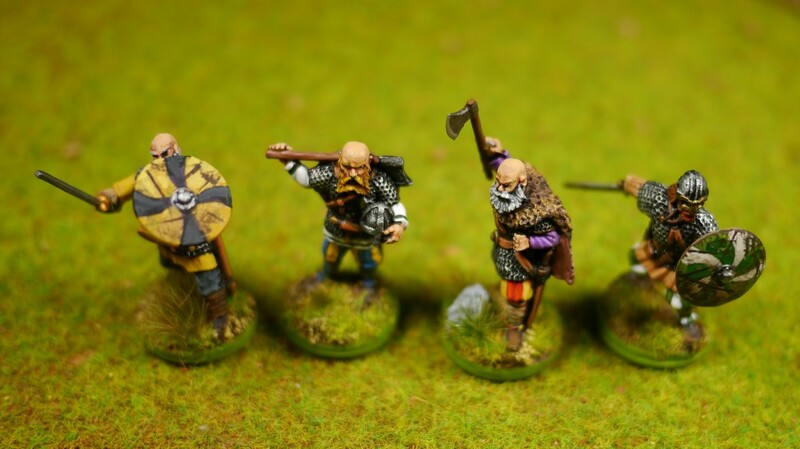 The rest of the army will consist of two more units of Hirdmen (one of them Berserkers – who would ant to play Vikings without them? ), a bunch of levy archers and finally the Warlord himself. Very best regards and have a nice Sunday!